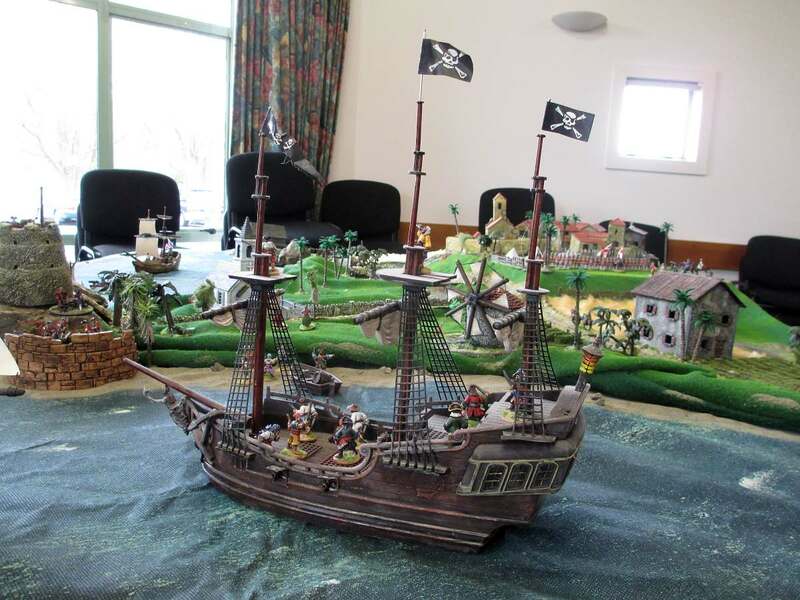 Yo ho ho, and a bottle of rum! At last I’m able to mention a project I’ve been working on for the last month, which has been shrouded in secrecy. 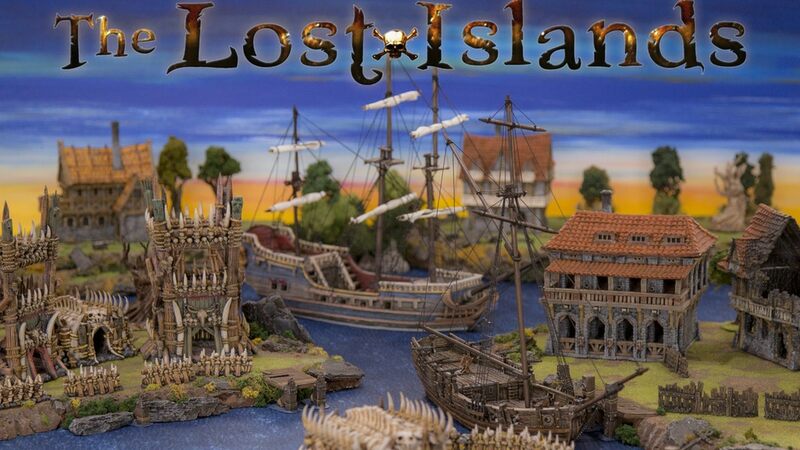 I was helping out my mates at Printable Scenery to prepare for their new ‘Lost Islands’ Kickstarter, which launched this morning. 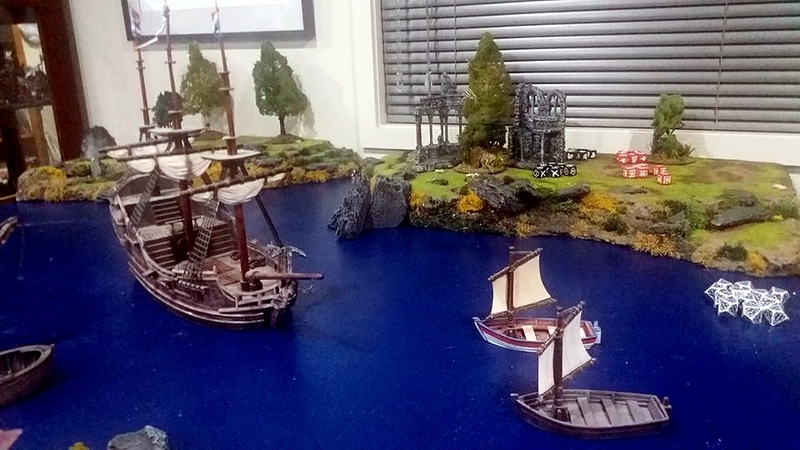 They asked me to build a couple of their prototype ship models for use in the photography on their site. I was only too happy to oblige, but I was sworn to secrecy to ensure maximum impact when the Kickstarter came out. 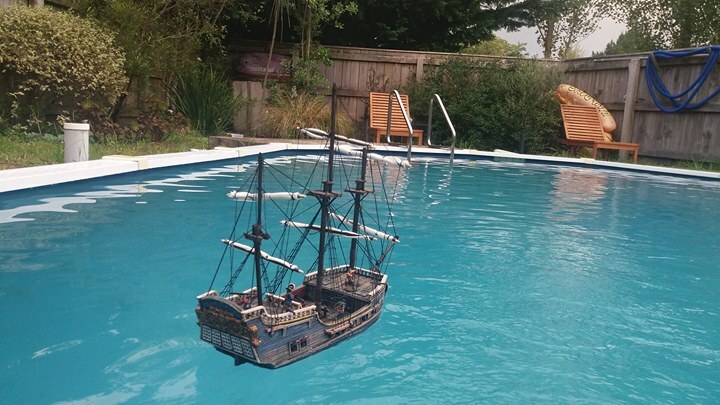 I almost let the cat out of the bag when I posted some photos of the model sloop at sea in my swimming pool (yes, they actually float!) … but that was before I realised there was a secrecy clause, so I had to quickly delete the pics when I found out. 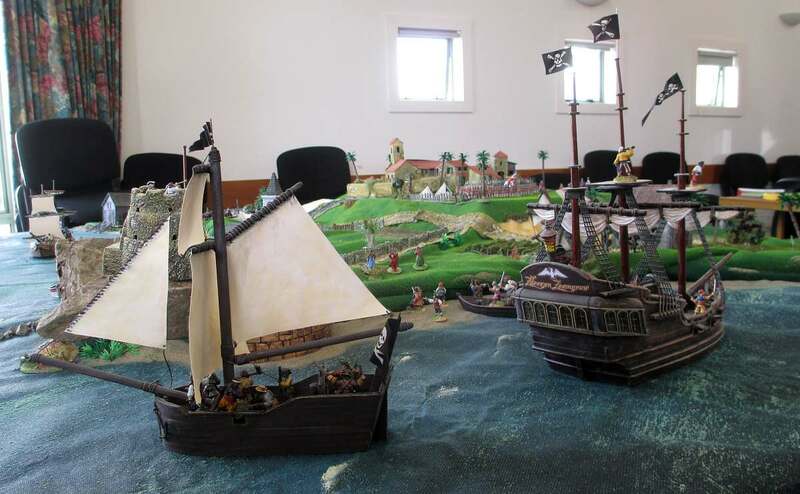 Swashbuckling adventure awaits. 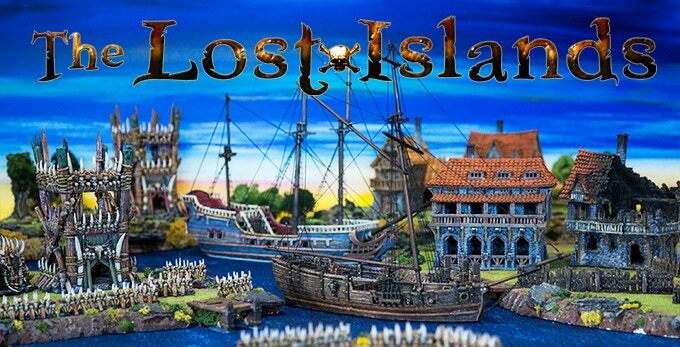 Sail with your motley crew from the wretched streets of Port Winterdale to the jungle tribes of the Lost Islands. 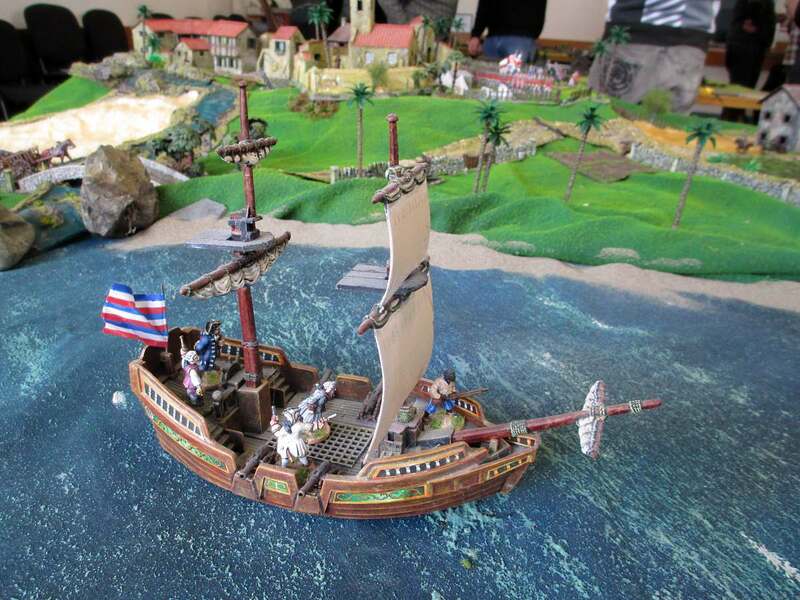 Defeat monsters, pirates and explore the world with nothing more than a barrel of rum, a fine ship and the stars to guide the way. 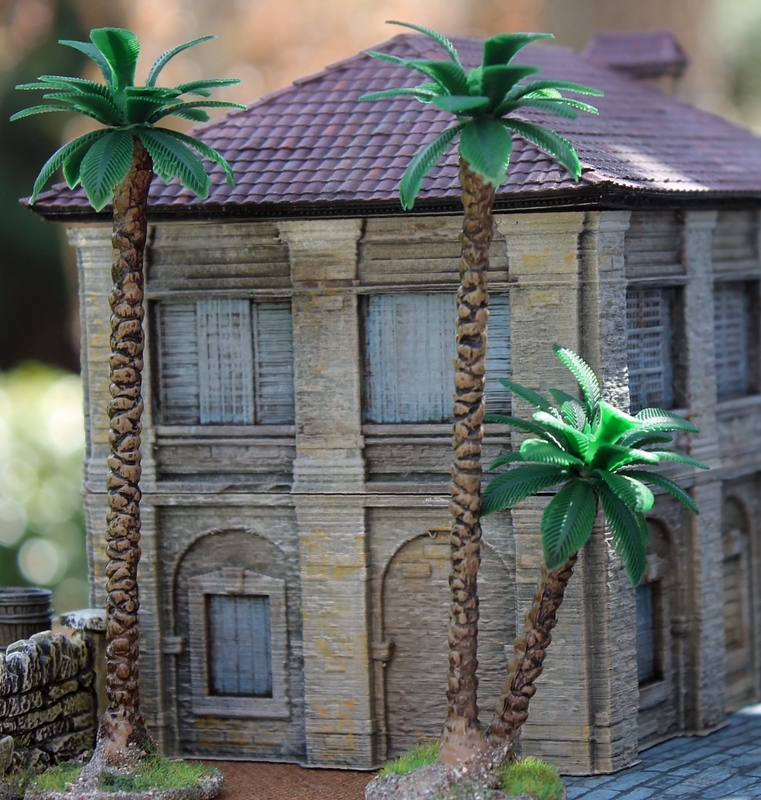 Each pledge is delivered as an STL file pack to print on a home 3D printer. 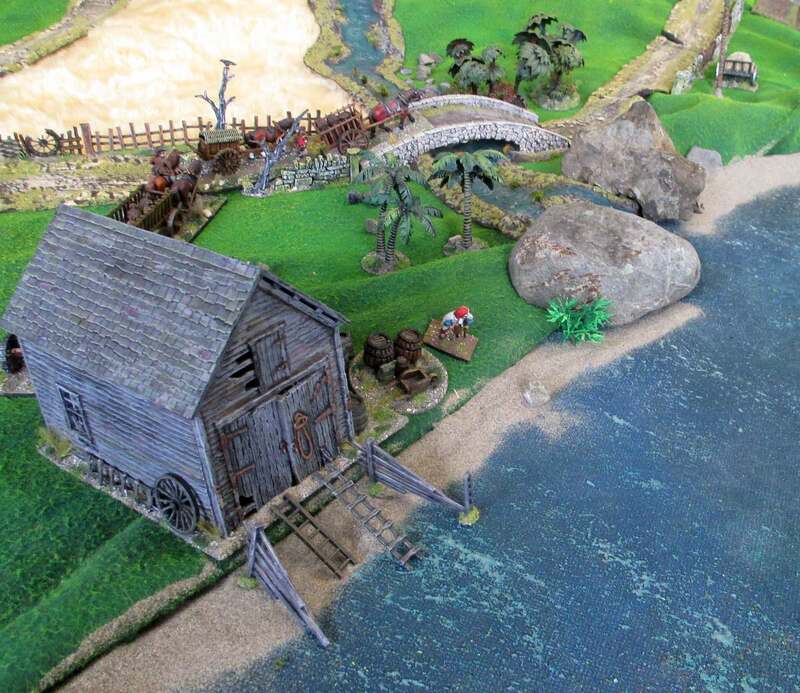 If you haven’t got a printer, then Printable Scenery also maintain a list of licenced printers around the world who can do the job for you. 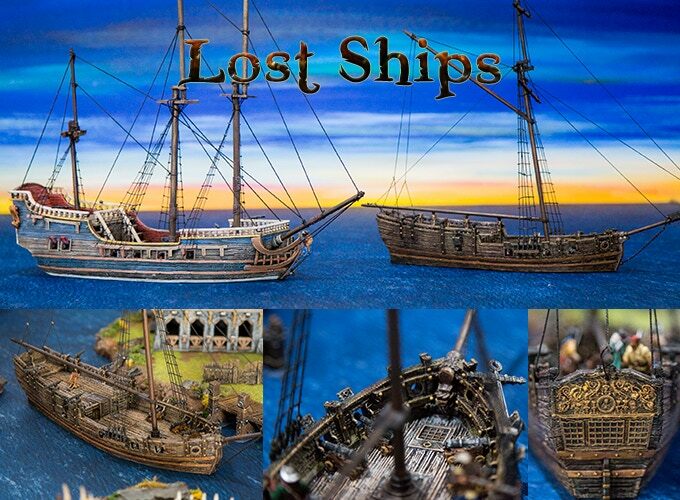 My brief was to build, paint and rig the two ships in the new collection – a sloop and a frigate. 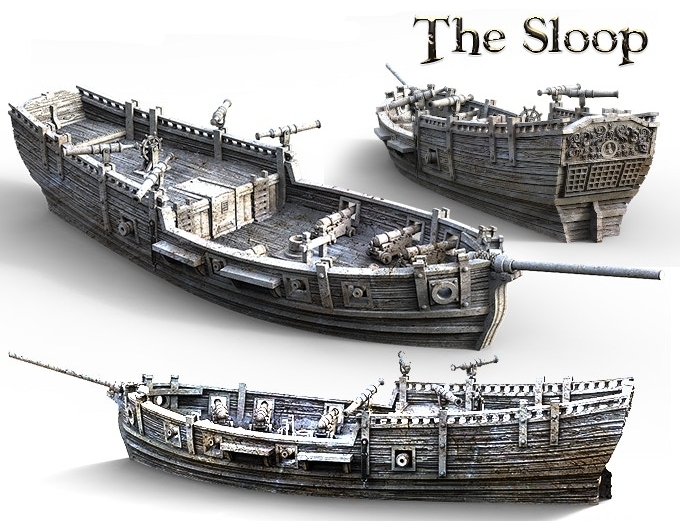 The first model I made was the sloop. 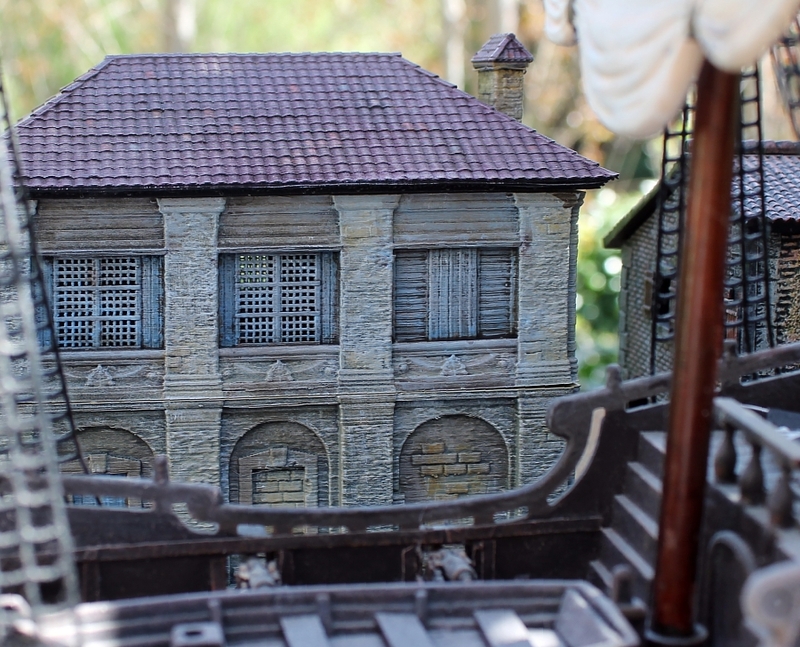 The hull was dead easy to paint – just a black undercoat, then dry brushing with a couple of shades of brown, and painting in details such as the carving, bolts and ironwork. 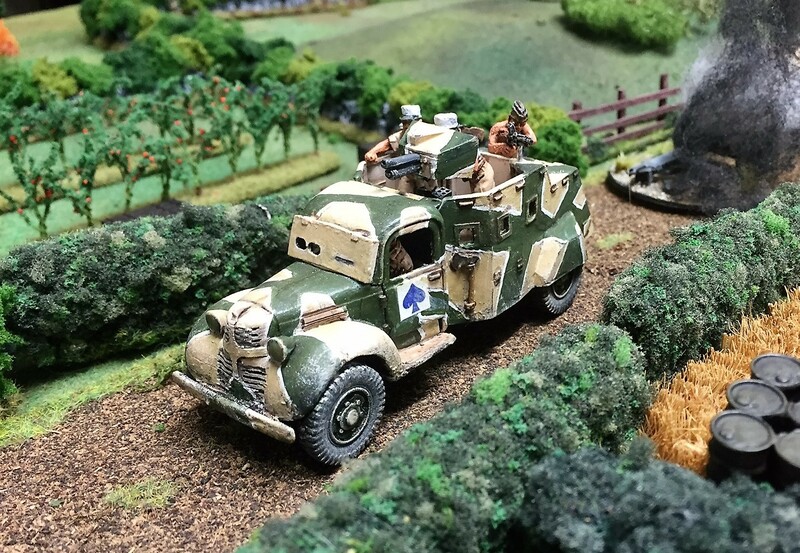 A final dry-brush with the lightest of coats of white really brings out the detail, and weathers it at the same time. 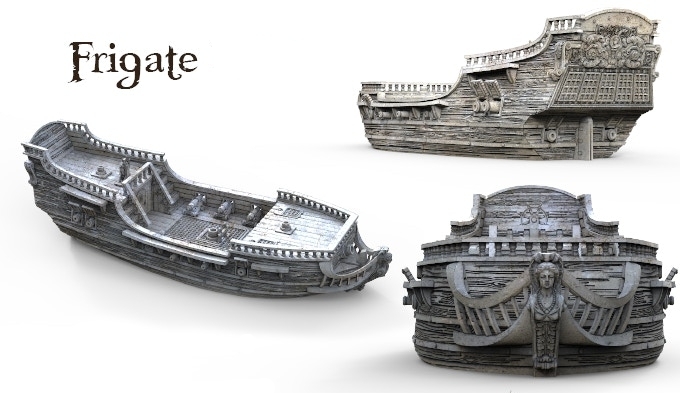 But use only a very light touch – if you use too much white, the ship will look like its sailing the polar regions! 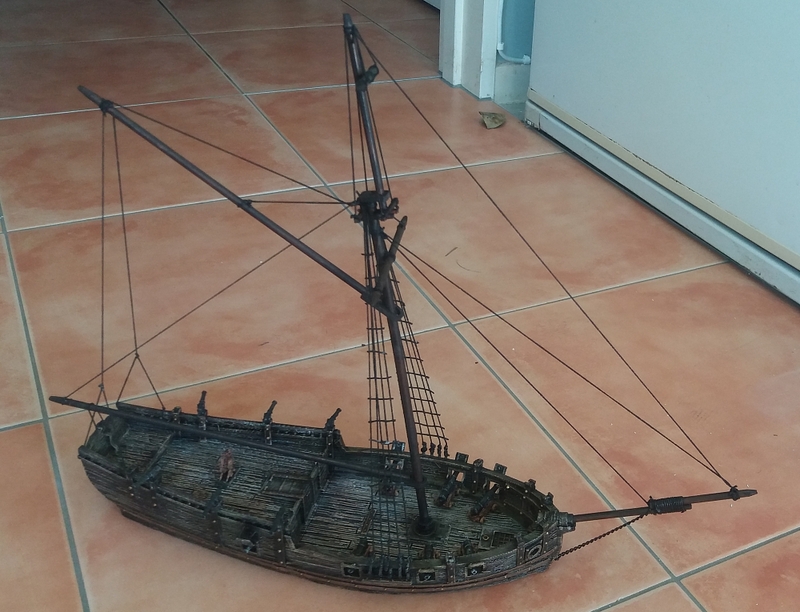 The rigging is the biggest challenge of making a sailing ship model. But I found it very easy in the end. 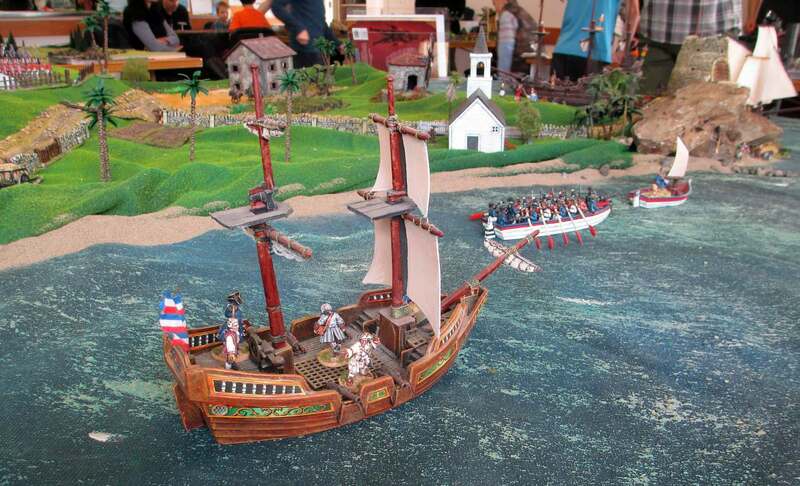 I used a couple of pictures of real sloops to give me an idea, then cut some pieces of dowel to size. 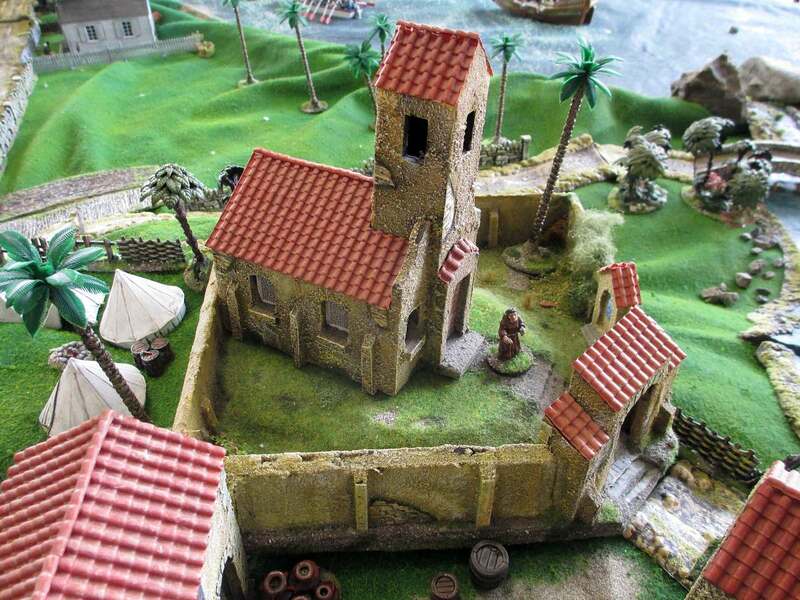 I roughly scratch-built the cross-trees where the main and top mast join together. 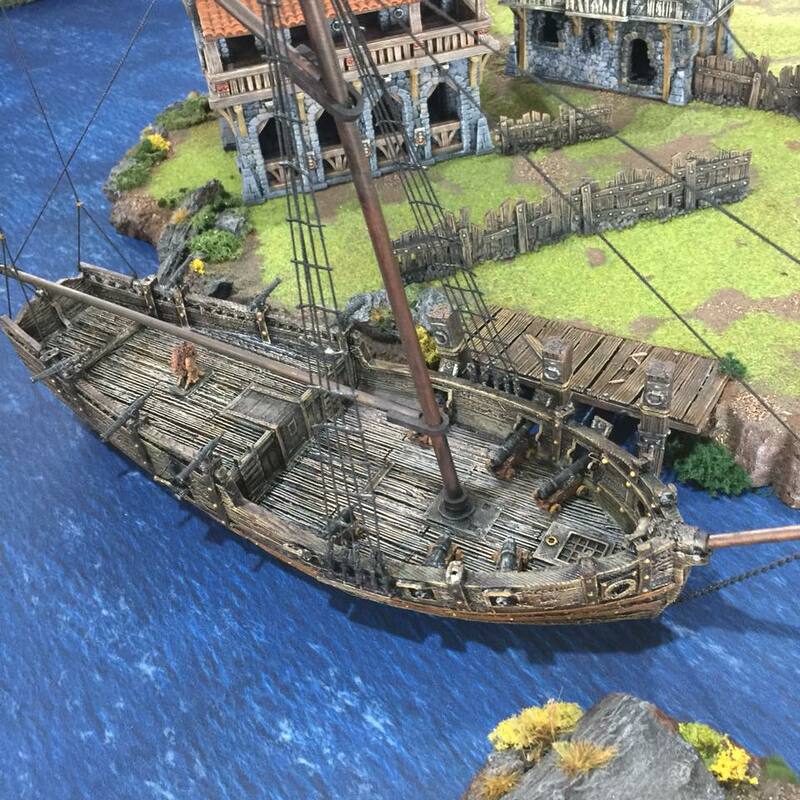 I gave the masts and yards tapered ends with a pencil sharpener. They were then all stained with normal household wood stain. I chose a rather dark walnut shade that I happened to have on hand. However, if I were to do this again, I would get an oak stain instead, I think. 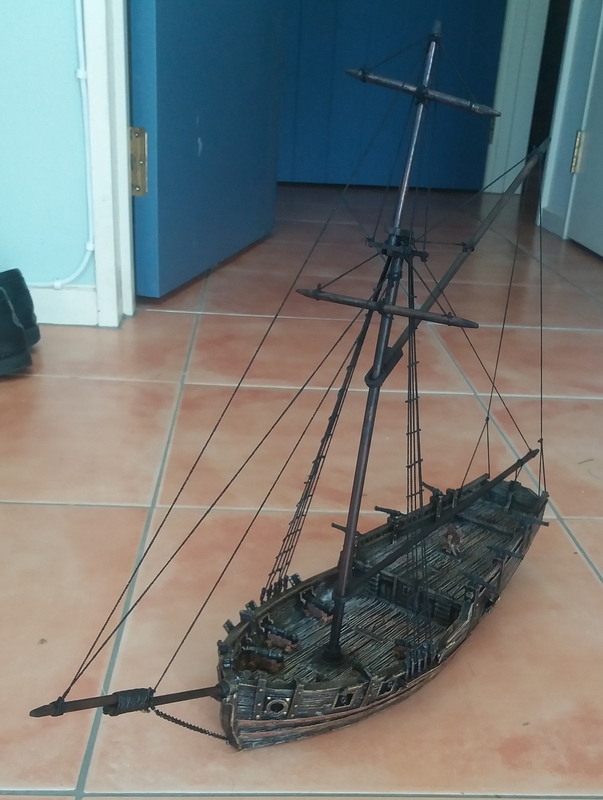 Once the mast and bowsprit were done, then I started on the rigging. 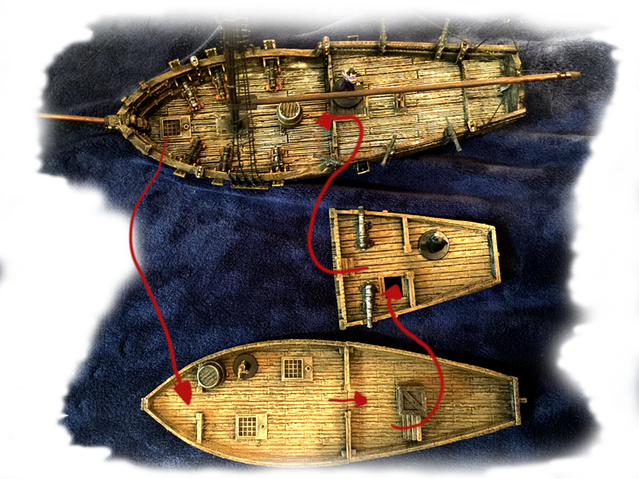 And this is where I found out the secret to ship modelling – use thin elastic instead of cotton or thread. With the latter, it is difficult to keep everything tight. But elastic keeps every shroud and stay of your rigging completely tawt. 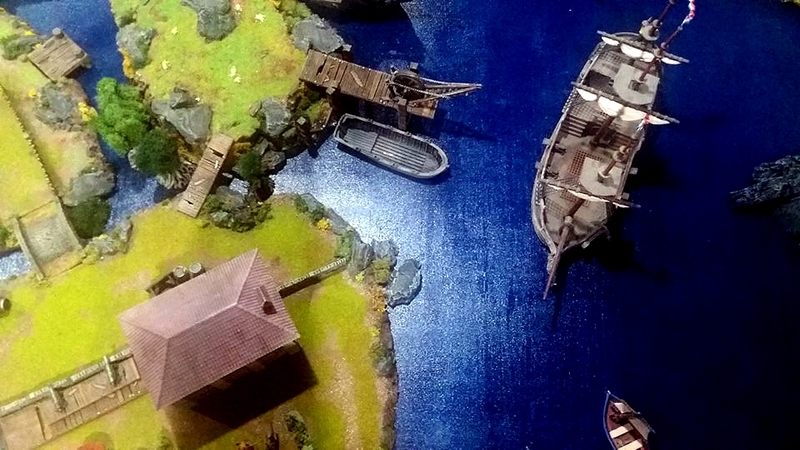 I had an added challenge – my project brief from Printable Scenery was to make the ships so they could be folded up to be transported from New Zealand to the USA to go on display at the GaryCon and AdeptiCon shows. By using elastic, this problem was quite simply solved. I just placed the masts into their holes in the hull without gluing, so they were held in place with the elastic rigging. 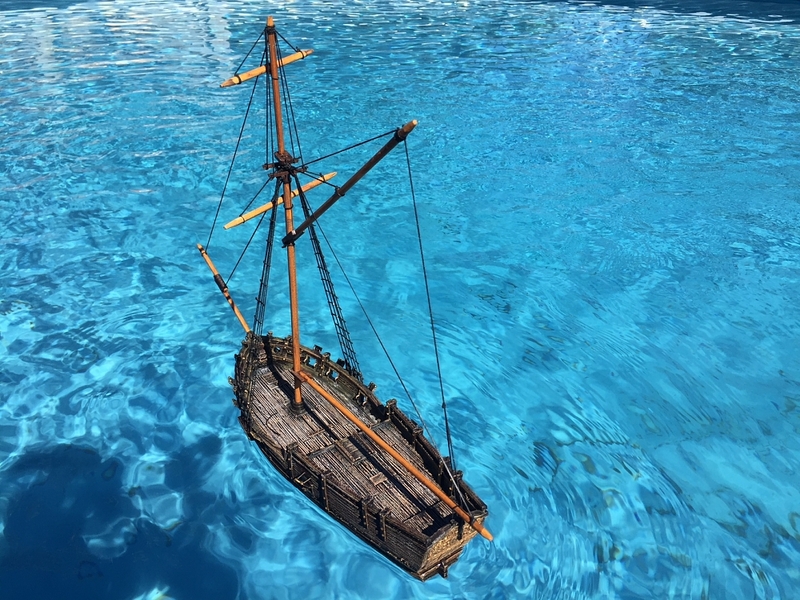 To fold everything down, all you have to do is lift the mast against the stretchiness of the elastic until it pops out of its hole, then lie everything flat on the deck. Reassembling, you just do the opposite. Simples! 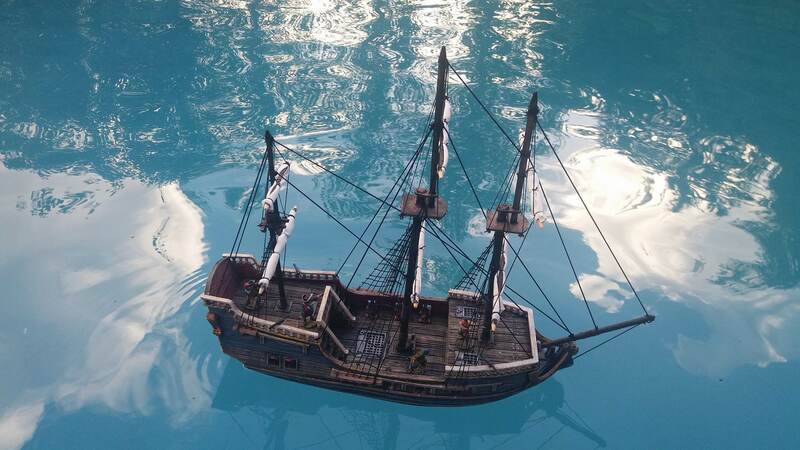 The actual model (though not the early prototype I built) will have accompanying layers to portray the interior, so your miniatures can fight ‘below decks’ a well. Cool! 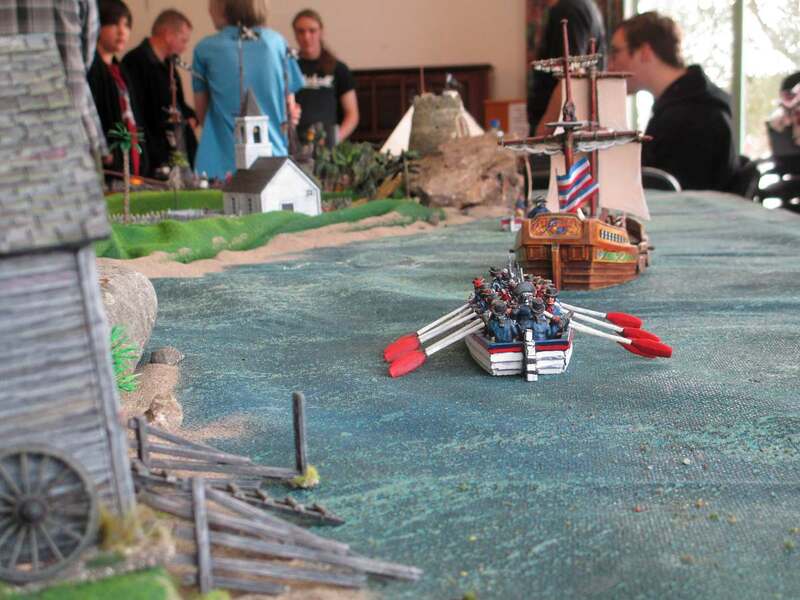 The frigate was a bit more challenging, as it has three masts. I also wanted to experiment with adding furled sails. 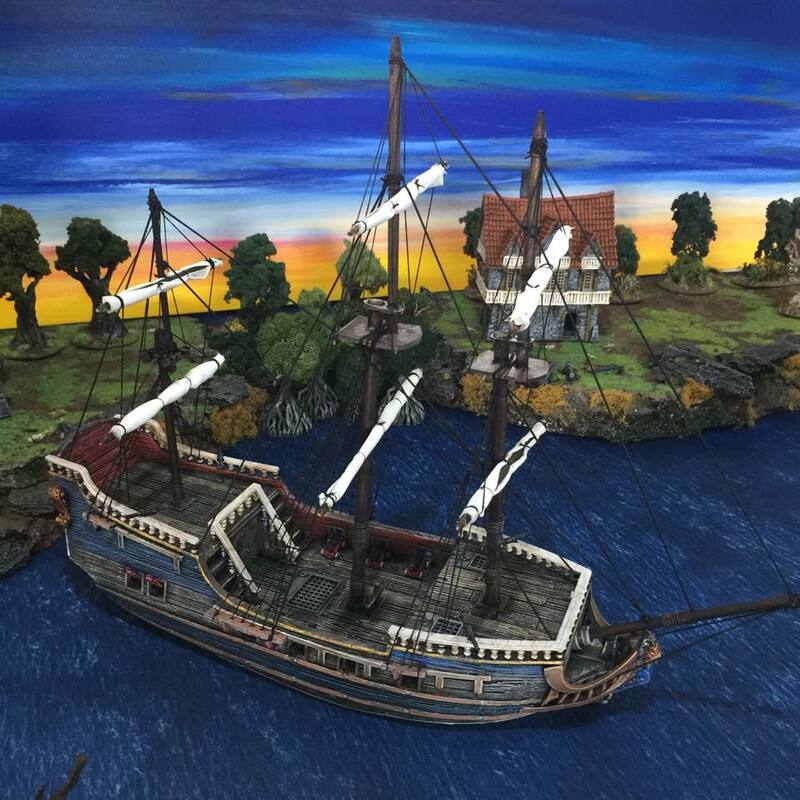 The hull was painted in the same way as the sloop, though I decided to add a a bit more colour, such as the blue and white upper-works, and the red insides to the bulwarks. 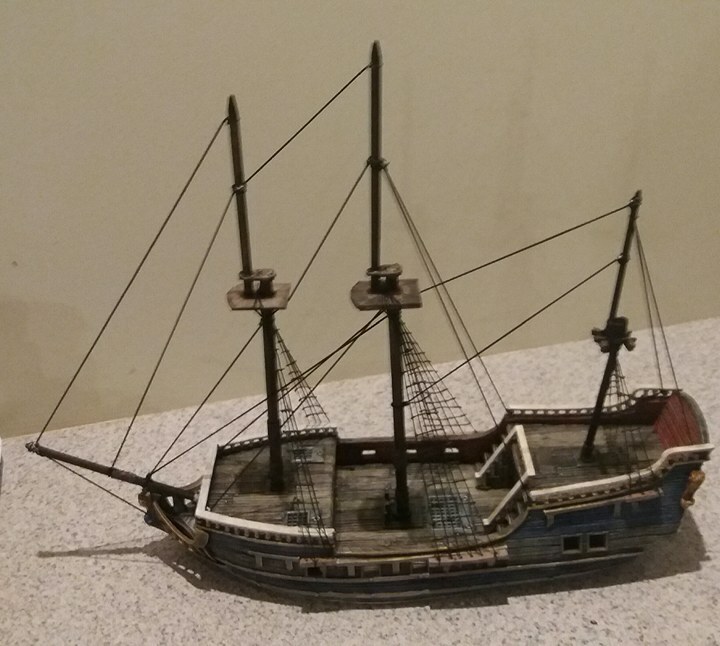 I used some cardboard to scratch-build the fighting tops that hold the top-masts to the fore and main masts, and a simple set of cross-trees for the mizzen mast. 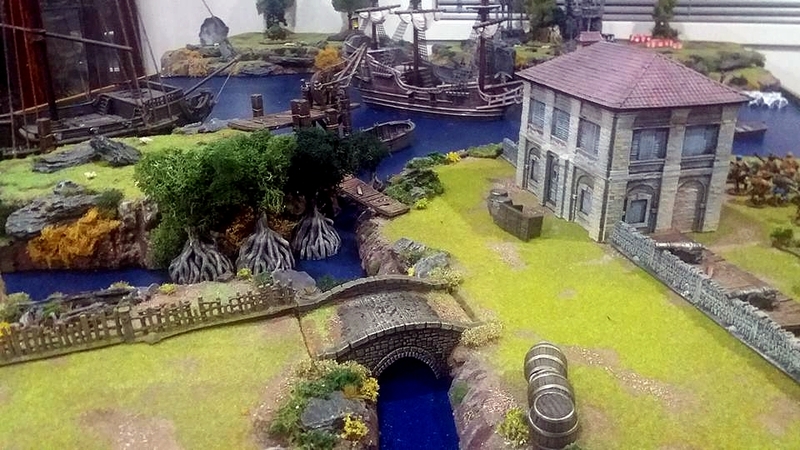 Winding a bit of string around the masts at intervals adds some interesting contrast to the plain dowel. 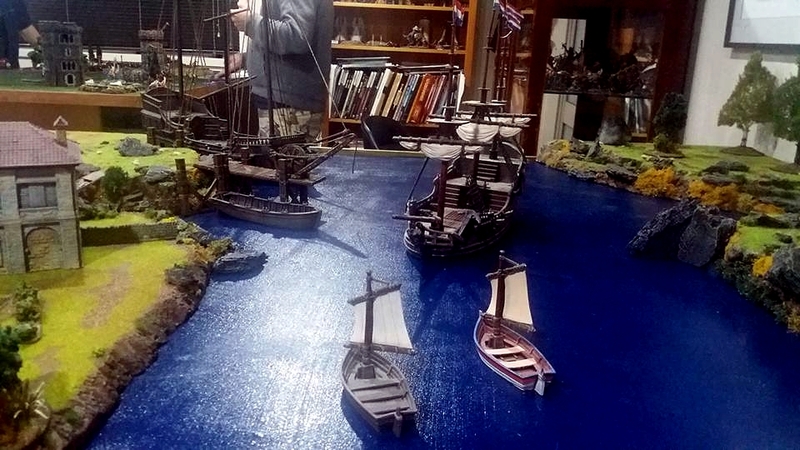 The hardest part was that I decided to move the position of the platforms where the shrouds and ratlines are attached to the hull. 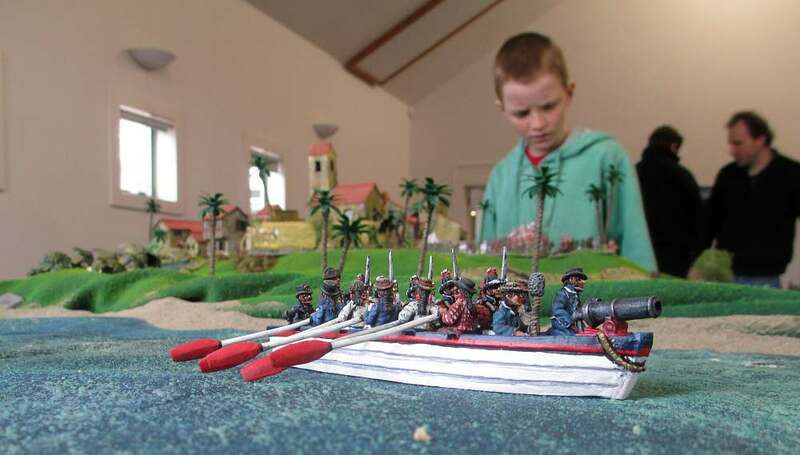 I preferred them to be smaller than on the printed model, and aligned behind each mast, rather than forward. 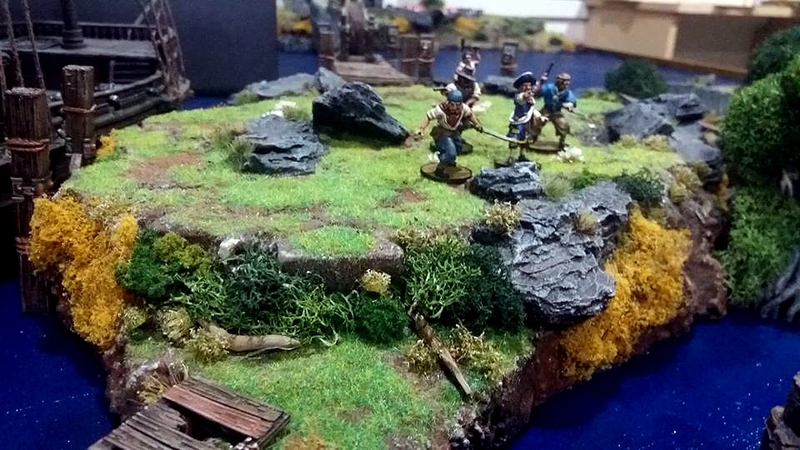 A bit of cutting and gluing of the platforms, and, hey presto, quickly done! 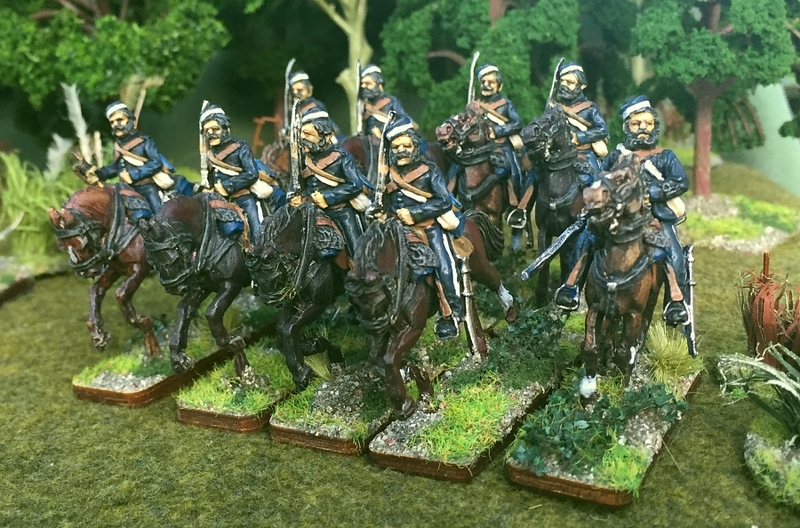 The ratlines are formed by gluing bits of cotton across the shrouds (tying them on was far too fiddly for me!). The sails are some light linen folded into position and tied onto the yards with elastic. 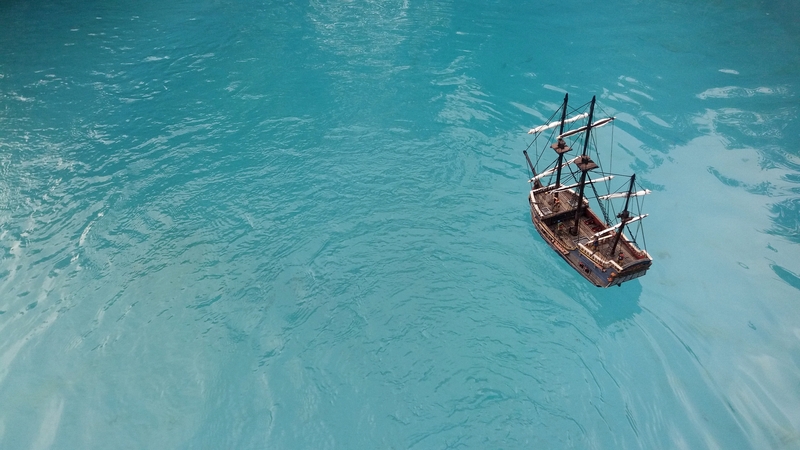 Of course, I just had to see if this ship would float too, and, sure enough, it did! 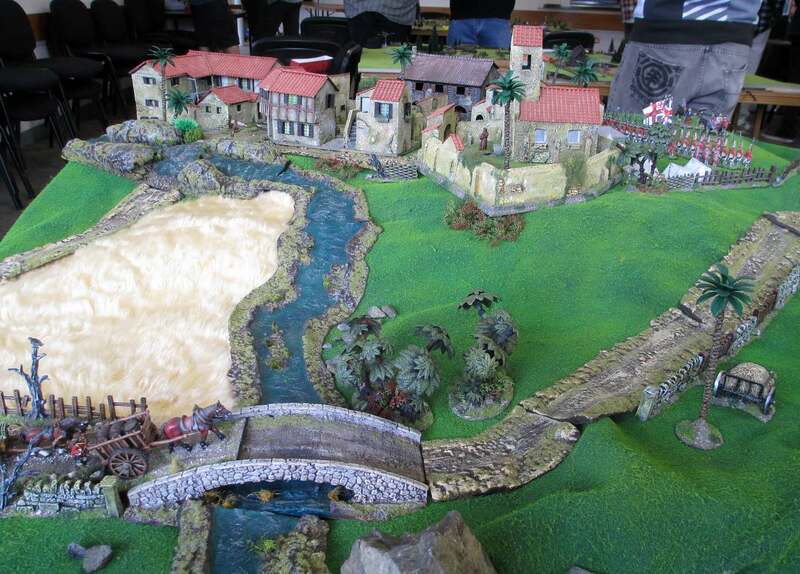 Hmm, playing a wargame in a swimming pool – that brings to mind some ideas for the future …! 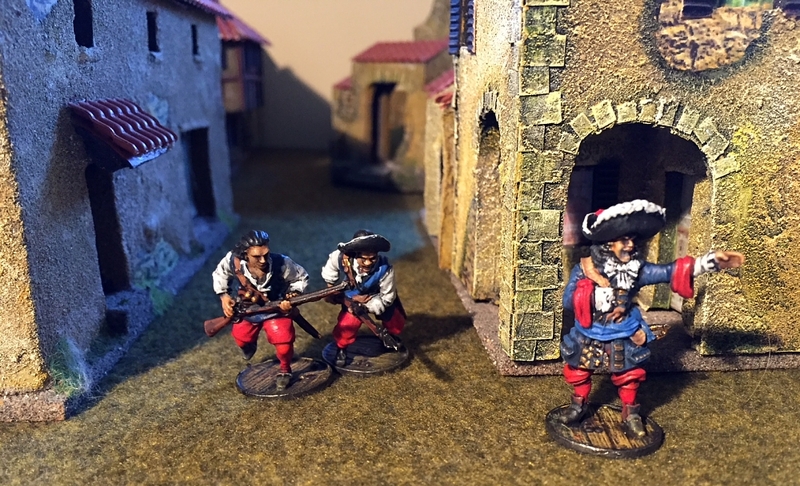 I’ve finally finished painting my French faction for the pirate game Blood and Plunder. Despite the undoubted beauty of these sculpts, this project has been a long one by even my usual slow painting standards. My initial enthusiasm wore off mid-project for some reason, so getting the mojo to finish painting them has taken quite some doing. 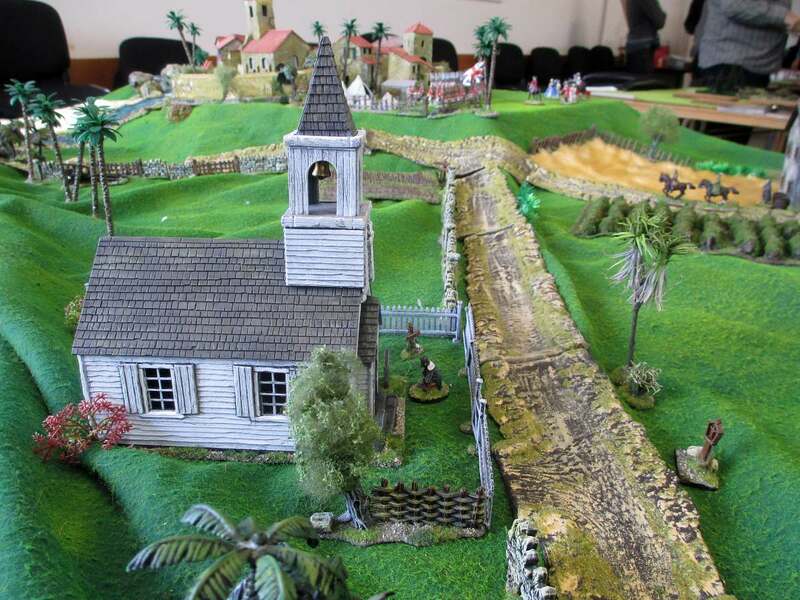 I’ve divided the Milice des Caraibes and the Flibustiers figures into two similar units of eight men each (on the right in the above picture). I painted the Milice in off-white coats, which was the most common French uniform colour at that time. The Flibustiers are in blue and red. 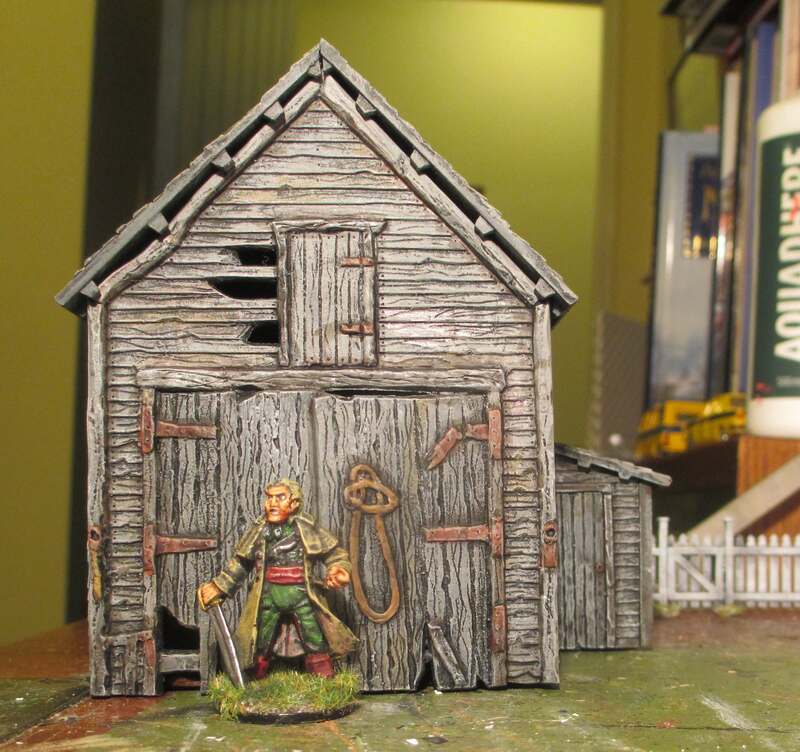 Trying out Army Painter Quickshade for the first time helped quicken my pace towards the end. 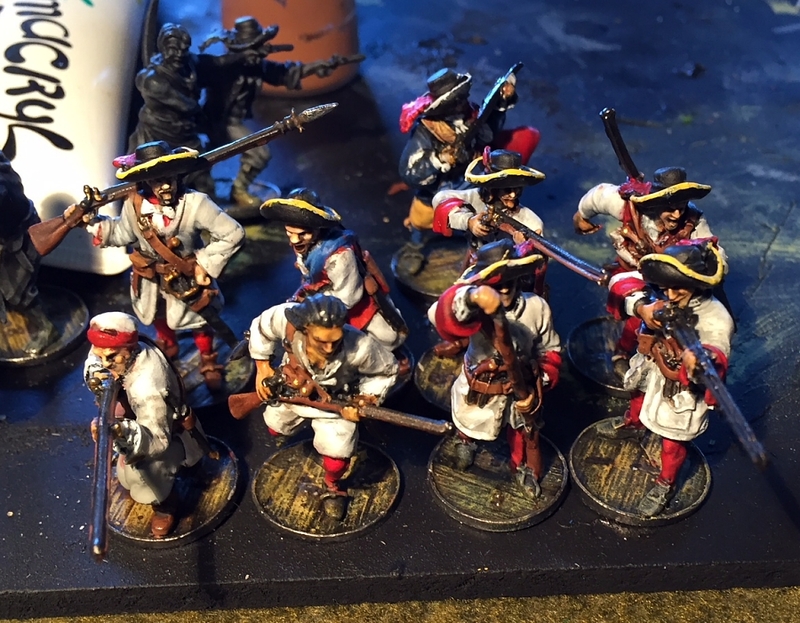 Whilst the Milice and Flibustiers were painted in my normal three-shade style, the Marins and Boucanniers (on the left in the above pic) were simply block-painted and then shaded with brushed-on Quickshade to give depth. I was quite pleased with the final result of this short-cut method. This has got to be one of the longest paint-jobs I’ve ever done. 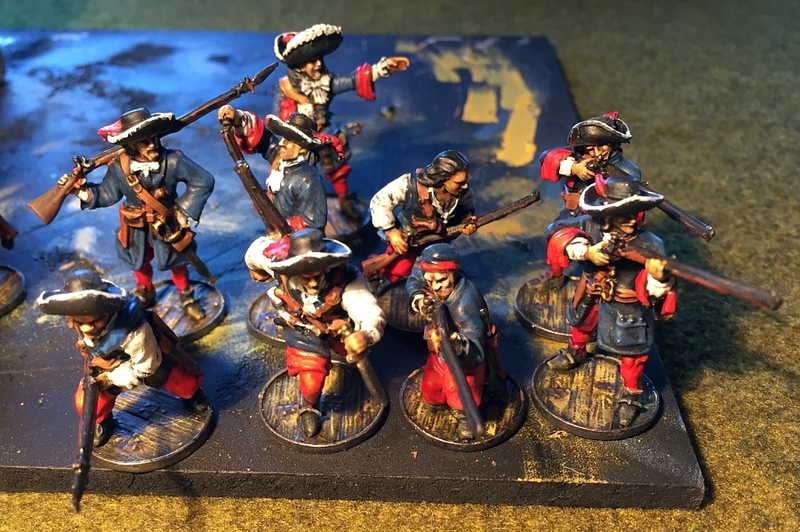 A measly eighteen French flibustiers and militia from the Blood and Plunder range by Firelock Games have taken me months and months to paint. There’s nothing wrong with the figures. In fact, as you can see, they are absolutely exquisite sculpts. But for some reason my heart wasn’t into painting them. 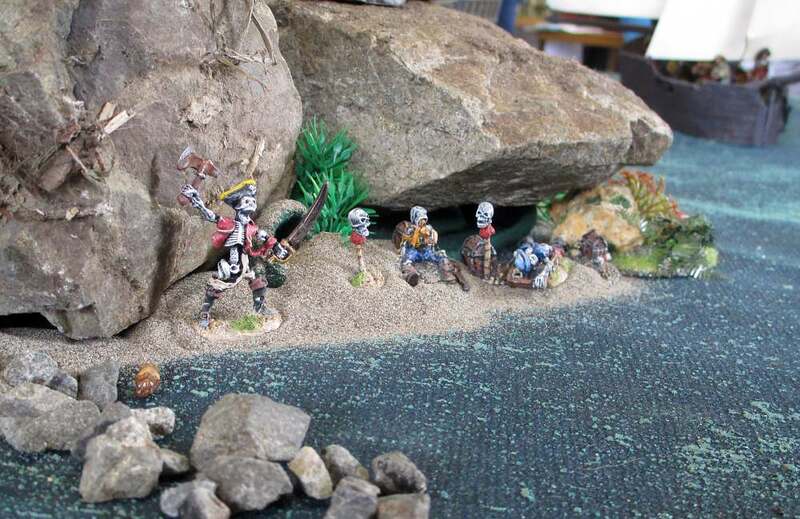 Maybe because it is that I have already painted pirates before? Or maybe it is just my whole painting mojo needs a refresh? I’m not sure. But, anyway, here they are at last. 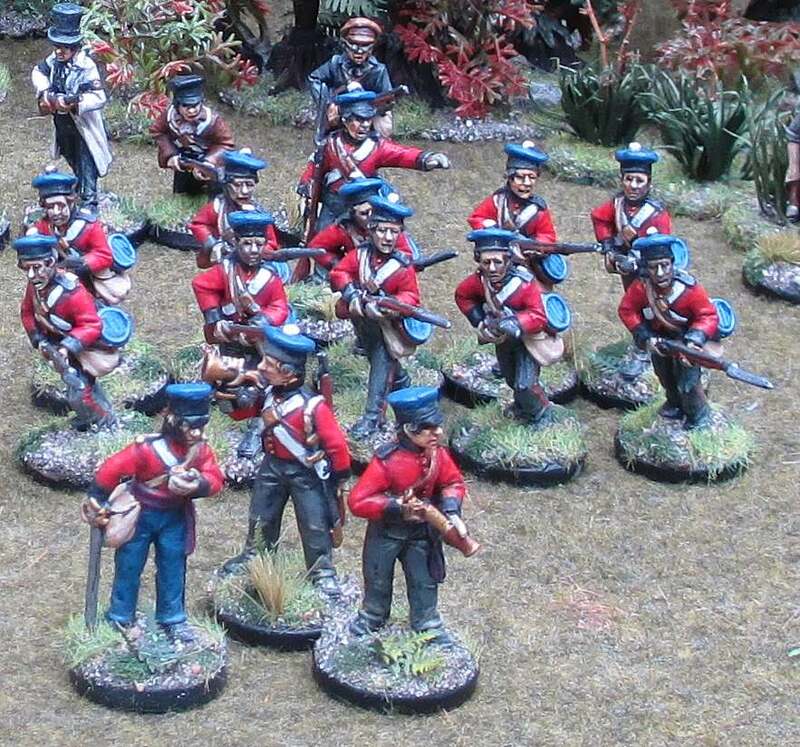 I still have eight boucaniers and seamen to paint (and, again, seem to be continually putting off starting them). 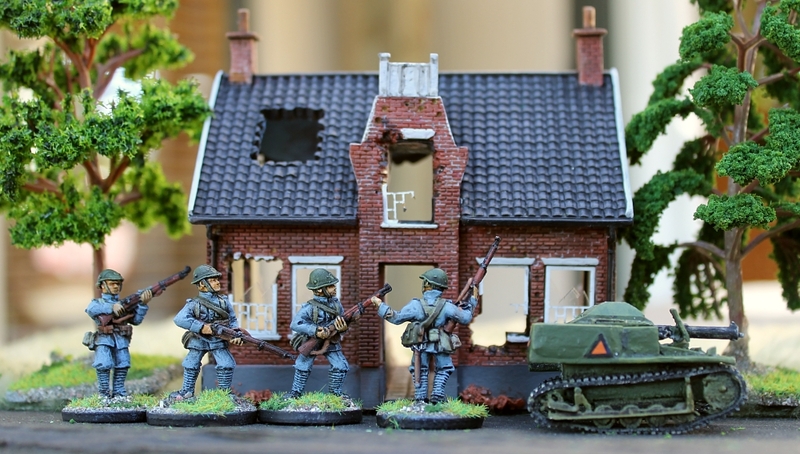 And I have a Dutch faction ordered from their Kickstarter – I hope my mojo comes back before they’re due to arrive next year. 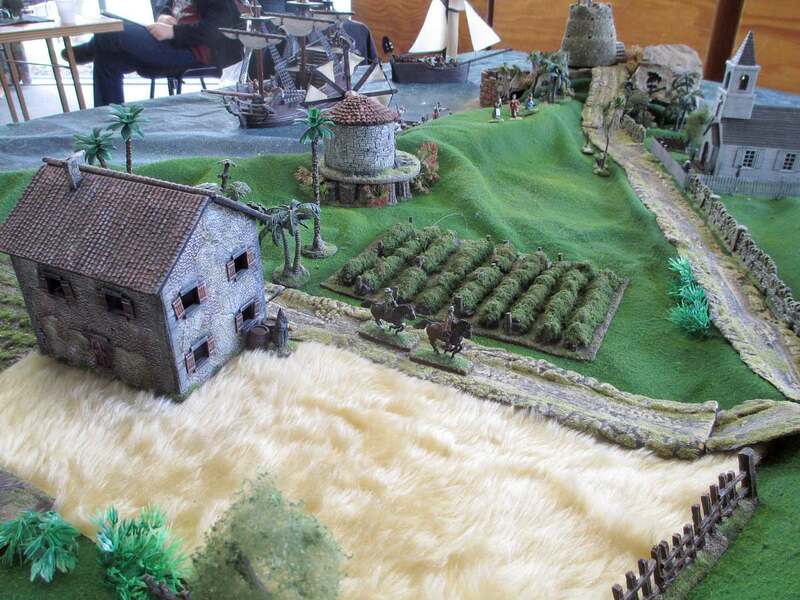 Above: My French captain orders his men into the fight. 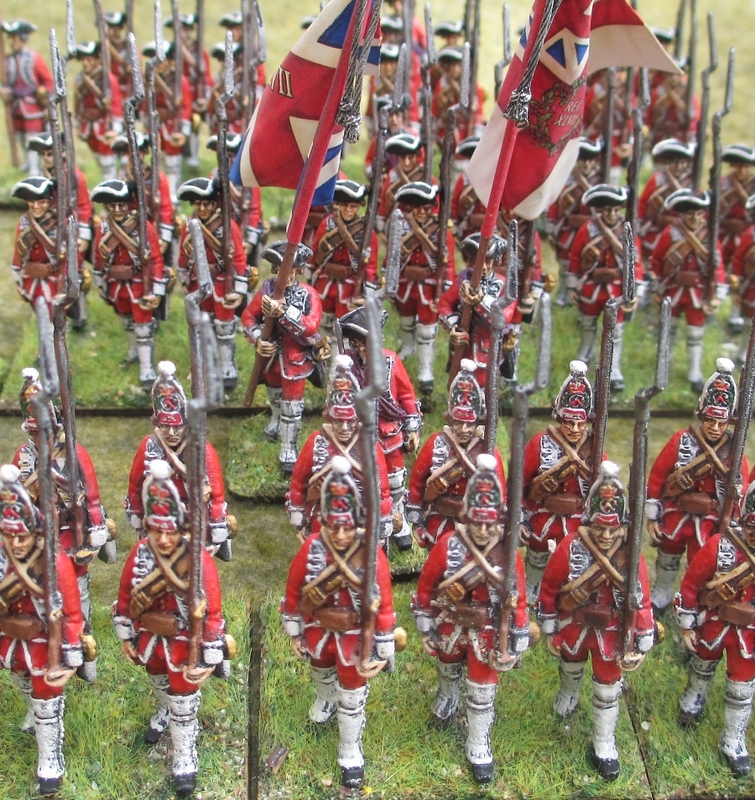 Above: The flibustiers in their snazzy blue coats and red breeches. Above: French ‘special character, Francois L’Olonnais. 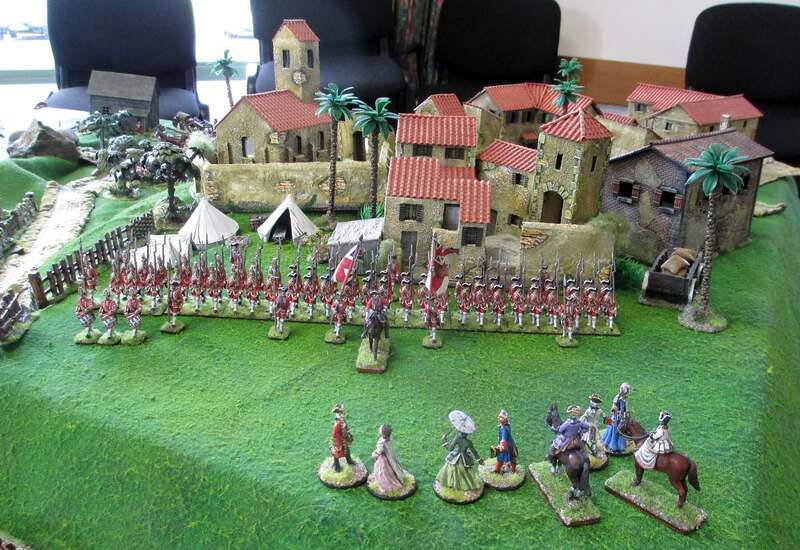 Above: The Milice de Caraibes (militia), which I painted in Bourbon pearl-grey uniforms. 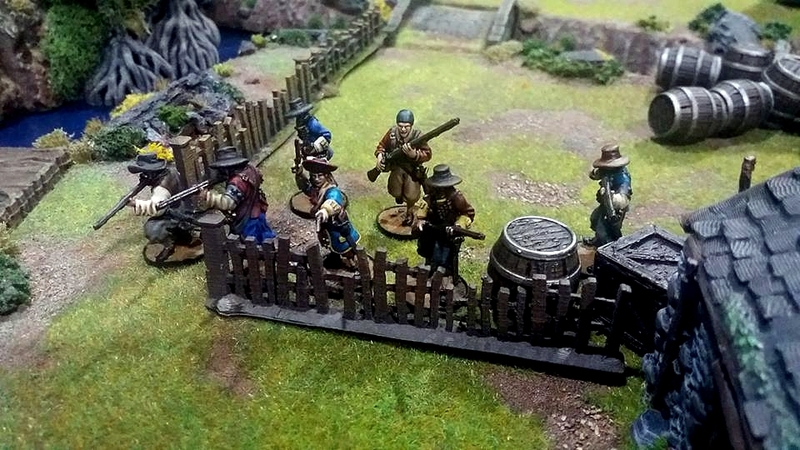 Last night I played my first game of Blood & Plunder by American company, Firelock Games. 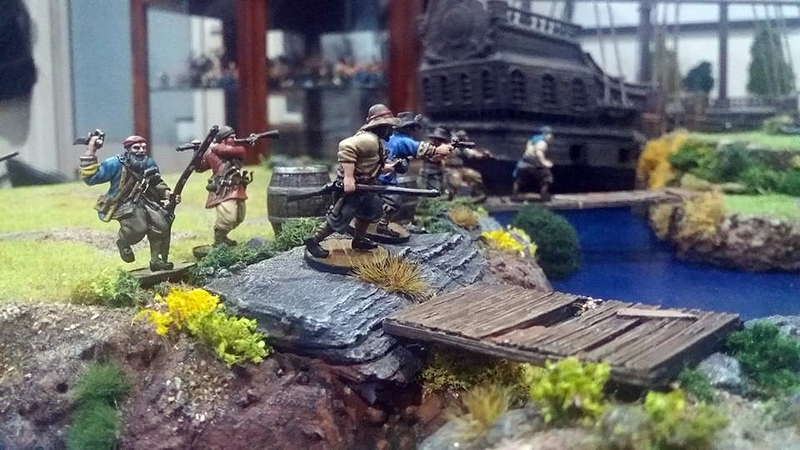 Blood & Plunder is a 28 mm historical miniatures wargame set in the 17th century during the golden age of piracy. 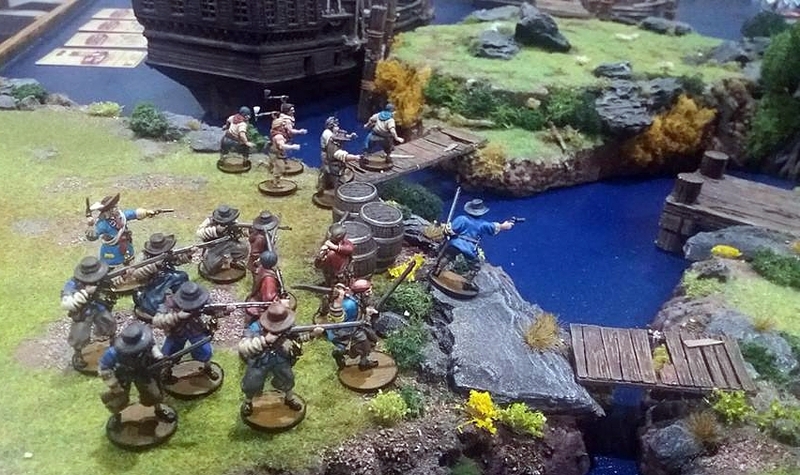 When Alix Barclay showed me his exquisite Blood & Plunder figures a few weeks ago, I was instantly hooked, even though I already own a Foundry pirate force. 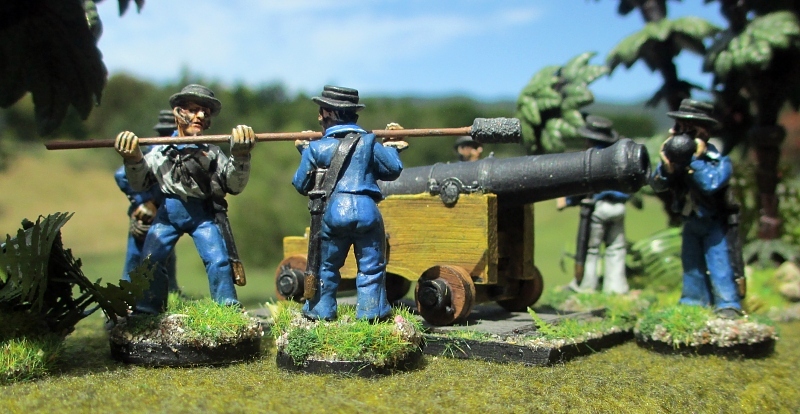 I quickly bought a small French force, which I am currently painting (to be the subject of a future posting), and I have also ordered a Dutch force from Firelock Games’ latest ‘No Peace Beyond the Line’ Kickstarter project. Last night was a first go at the rules, so Alix and I kept things pretty basic. 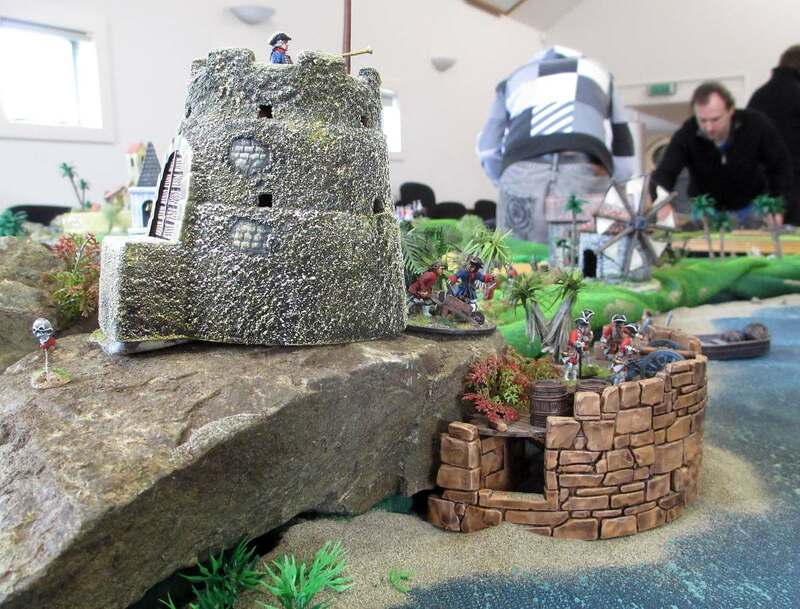 We just played a small skirmish on the shore at one end of the table, with everything else just providing a suitably luscious scenic backdrop. Anyone familiar with me knows that I am not really a rules person, what with my really bad head for numbers, so that I never remember what dice I am supposed to be rolling. throwing. 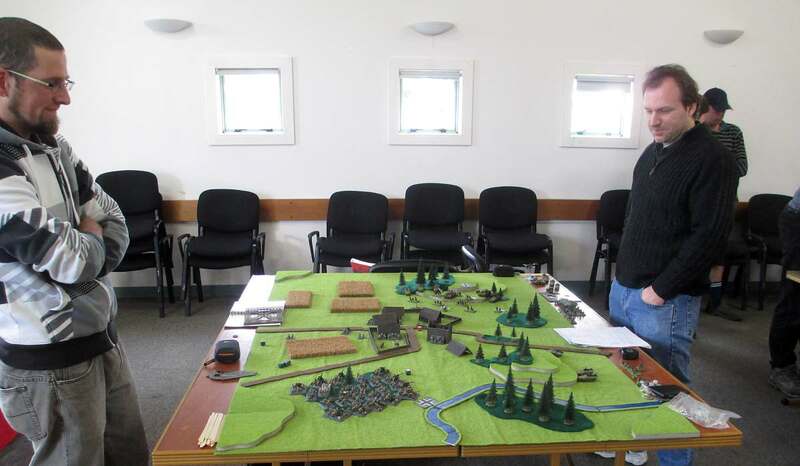 But the basics of this game seem relatively straight forward. 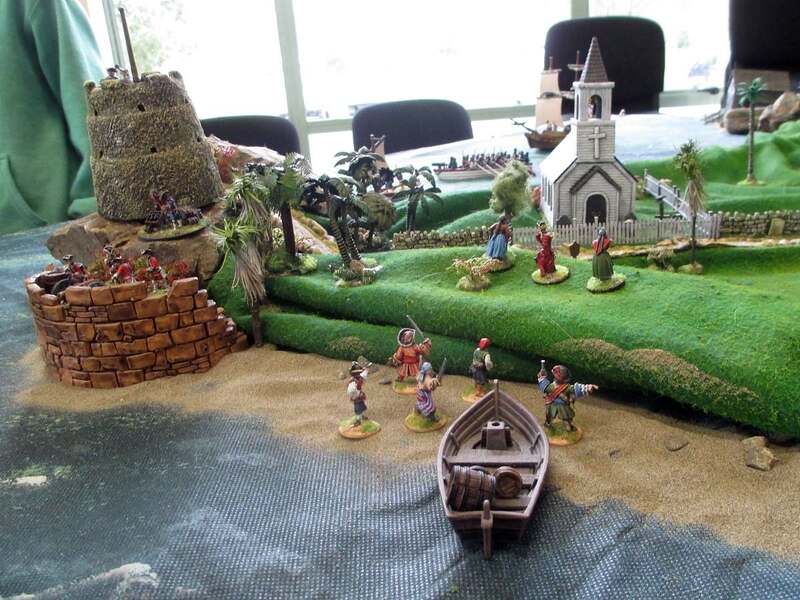 We were hosted by Matt Barker of Printable Scenery, who put together an amazing Caribbean scene featuring a lot of his company’s products. 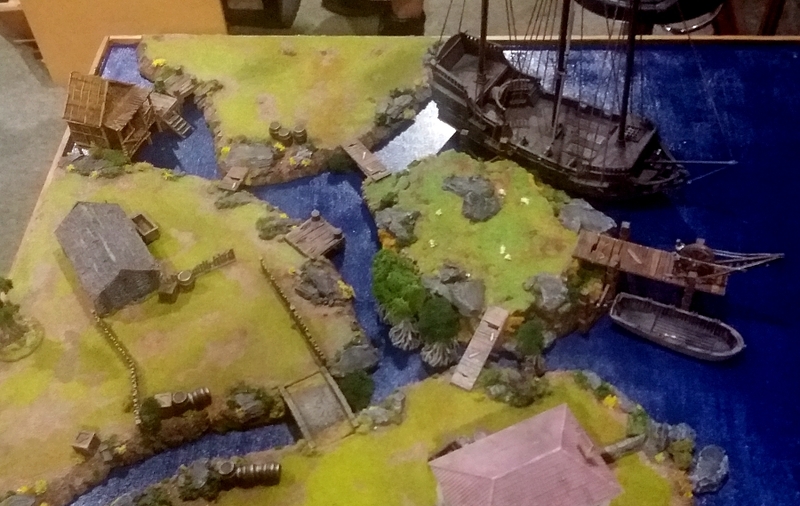 The buildings, bridges, a galleon, wharves, a crane, even a mangrove swamp, were all designed by Printable Scenery and run off on Matt’s 3D printer. 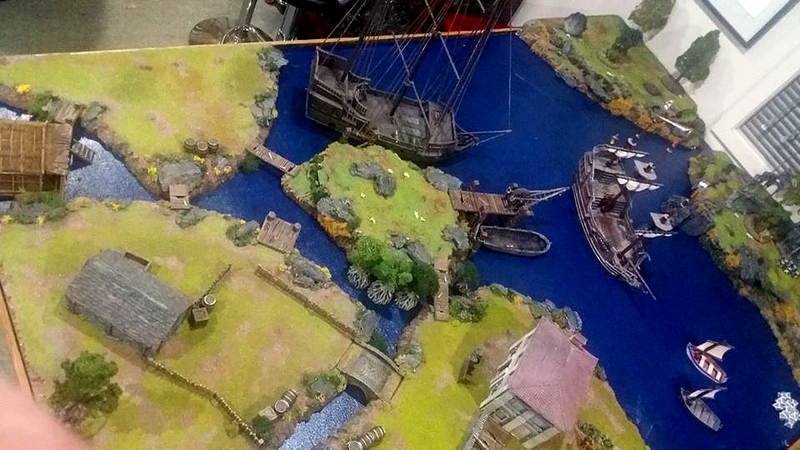 The only non-Printable Scenery items on the table were my own Disney ‘Black Pearl’ toy converted into a Dutch ship, and a couple of my toy longboats. 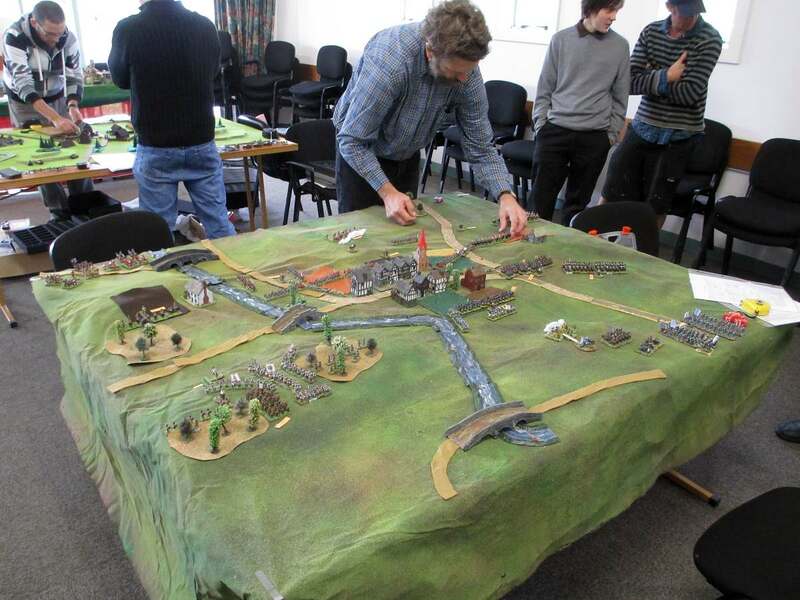 Whilst this was just a small test game, the terrain we played on was of the highest quality, and would have done any wargames show proud! 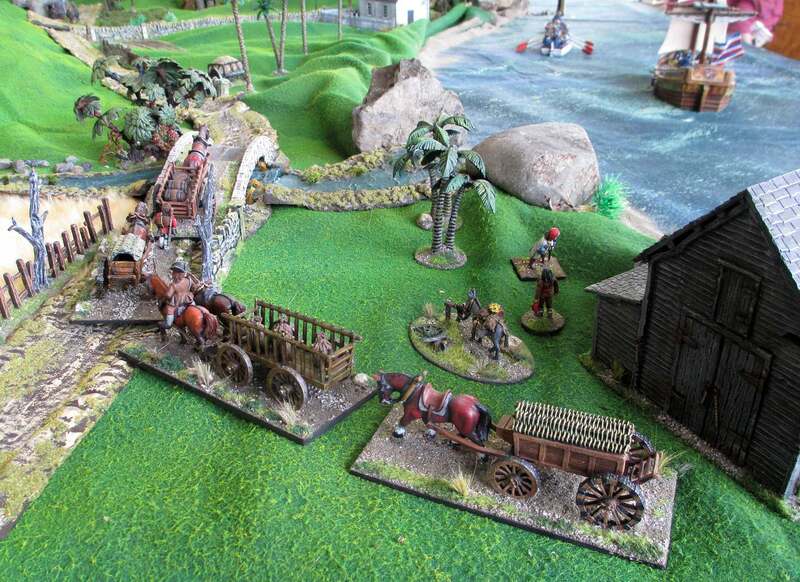 Here are just a few photos to give a general impression of this beautiful first game of Blood & Plunder. These last three photos were taken by Alix Barclay. 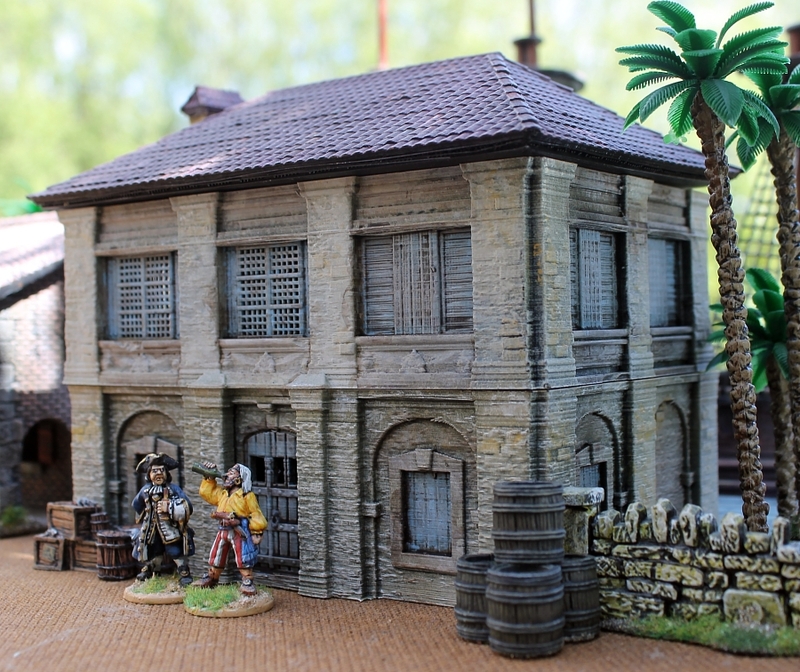 ‘Arrr, me ‘earty – that thar 3-D printin’ is sure makin’ inroads into wargamin’, ain’t it!’ And especially so for terrain, as shown by this exciting new model from Printable Scenery for my 28mm pirate gaming. The first step is to clean up any artifacts left over from the printing process, and then cover the whole model with black spray-paint. Apart from that, no other work was required to get the nice finish you see above. 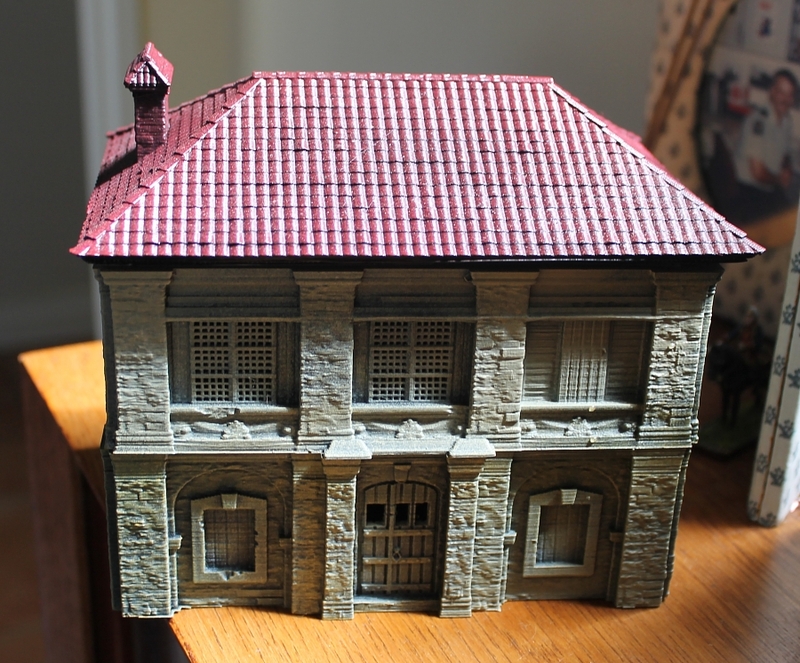 The model prints in three pieces, which means you can view the interior of each floor. 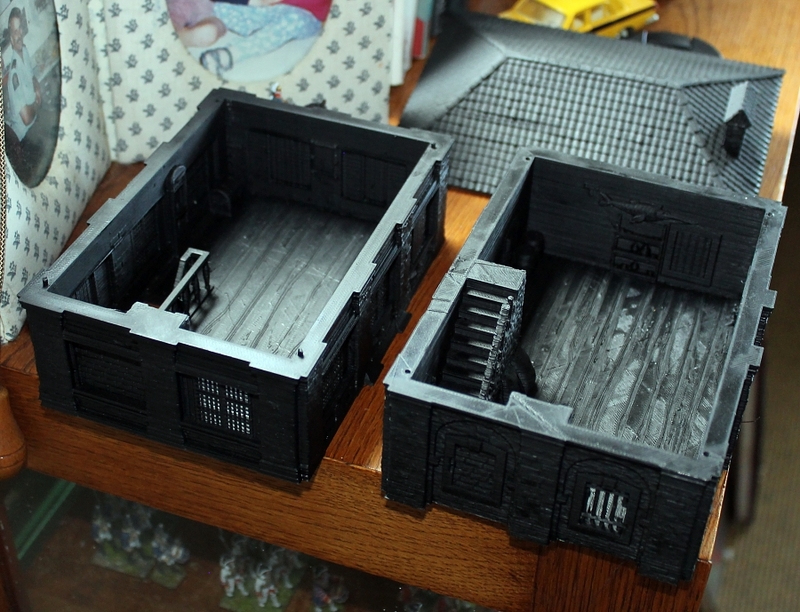 So the interiors also received a black undercoat. 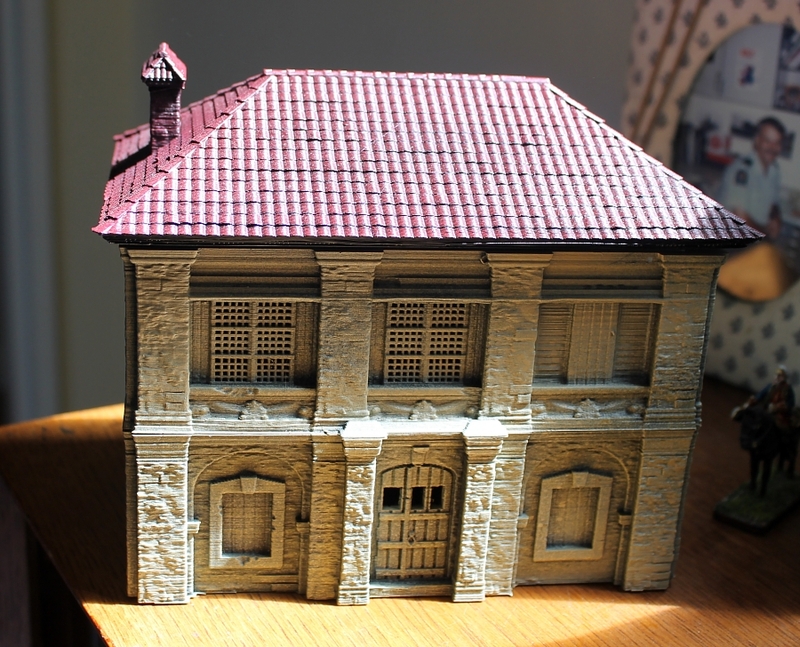 The two storeys now received a light spray paint of sand colour (I used Tamiya model spray). 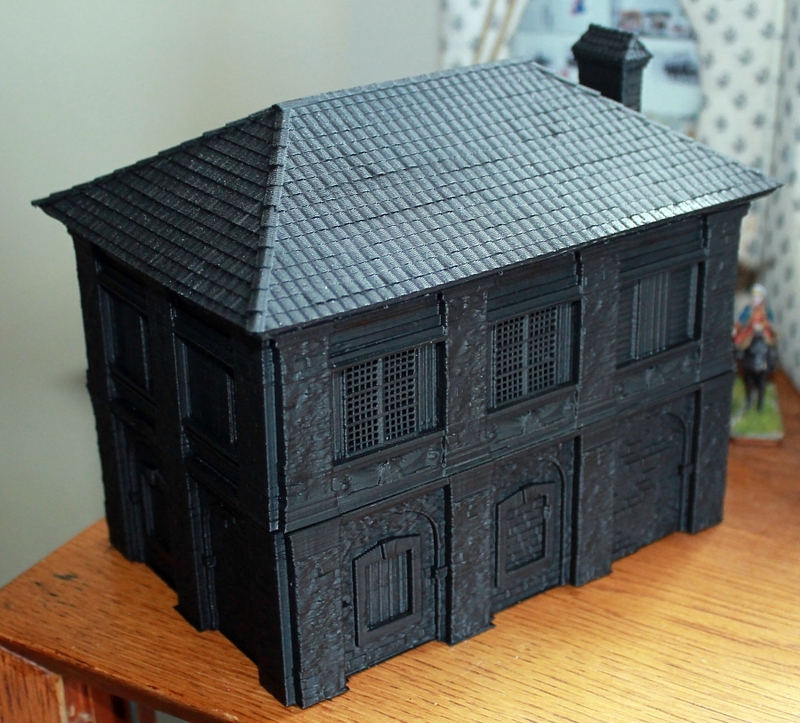 I sprayed this in quick sweeps from above, so the remaining black undercoat would create the effect of shadows. The roof received a light spray too, but in a brick-red colour. The interiors also got the light sand-coloured spray treatment. I don’t worry about over-spray on the floor – this all gets fixed later on. Now comes my favourite step – dry-brushing the entire model with white. This really brings out the texture of the stone-work and tiles, and you start getting a feel of what the final product will look like. 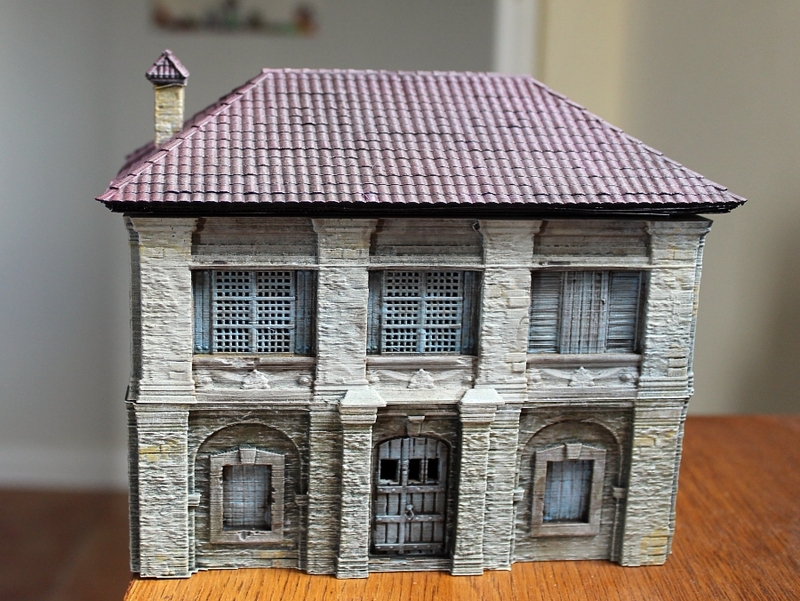 I picked out some of the stonework with a yellow-ochre colour, then dry-brushed over it with white. The chimney has also been painted ochre and dry-brushed white. 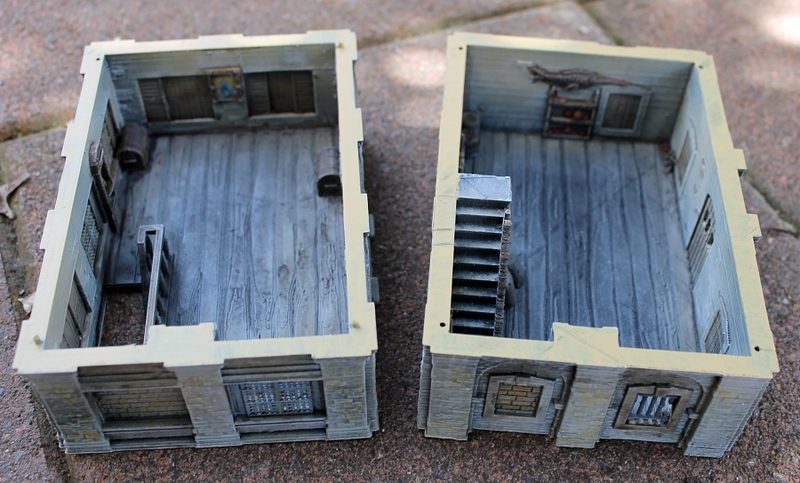 I slapped some sky-blue paint onto all the windows and doors. As you can see, I was quite rough and ready with this job, but that doesn’t matter, as the next steps clean this up. I coated all the blue windows in earth-coloured ink wash, and also inked in some of the shadowed areas in the stonework, such as under the arches. 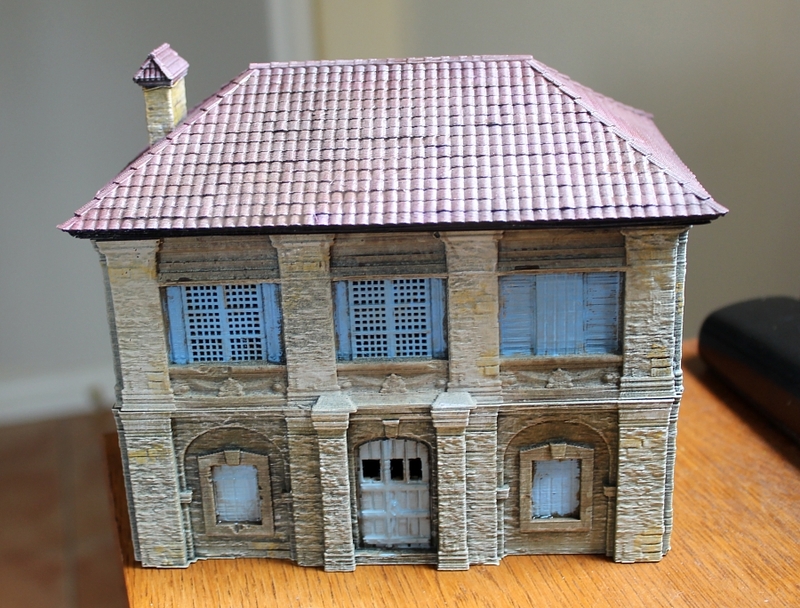 I then used my trusty white dry-brushing over all the windows – hey presto, sun-bleached light blue frames and shutters! 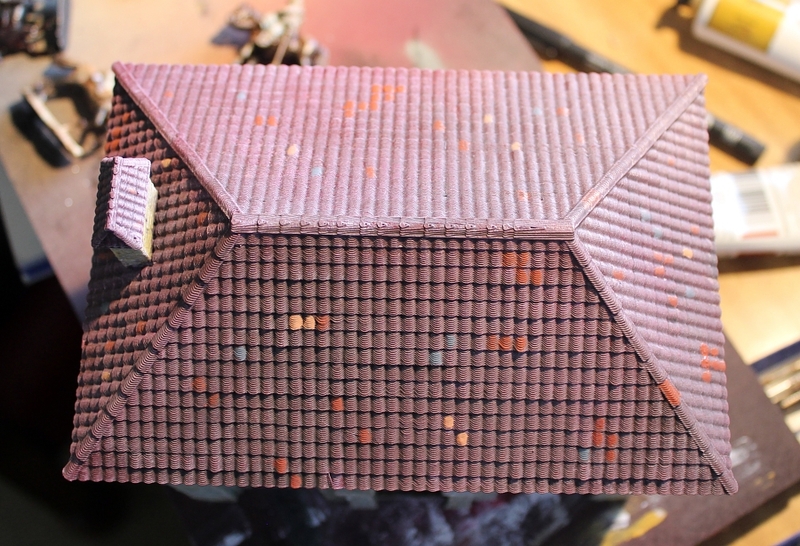 I picked out some random tiles with a range of colours, then game the whole roof another quick white dry-brush, before washing the whole roof with the earth-coloured ink to tone down the different shades. The final step was to paint the interior. I dry-brushed white the previously sand-coloured walls. 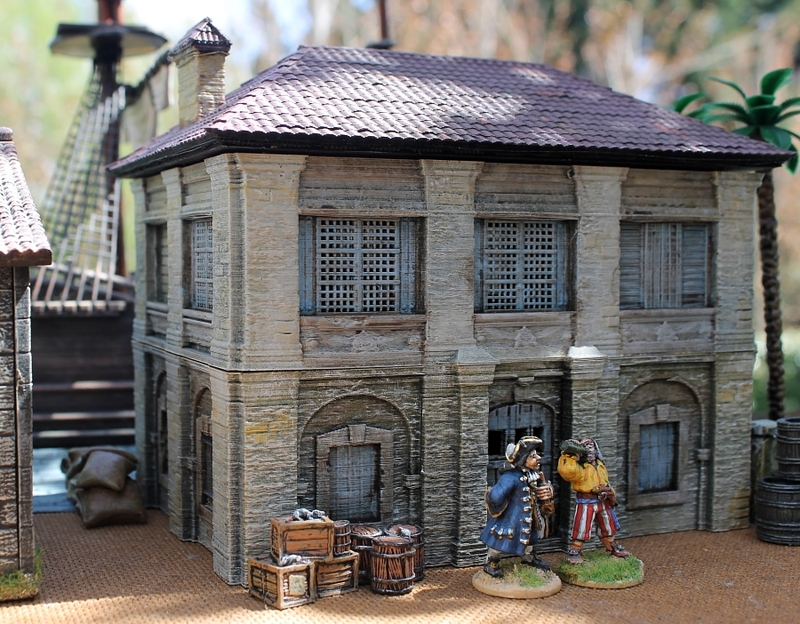 The furniture and window frames were mainly picked out with inks, but also a small amount of painting, for example the bottles and jars on the shelves. The floor received a wash of black ink to bring out the floorboard detail. 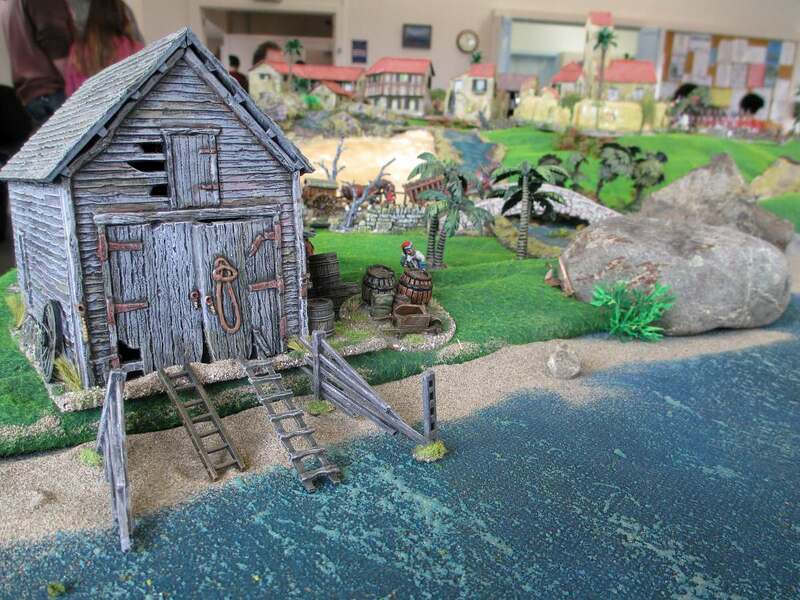 So there you have it, a perfect building for pirate games! 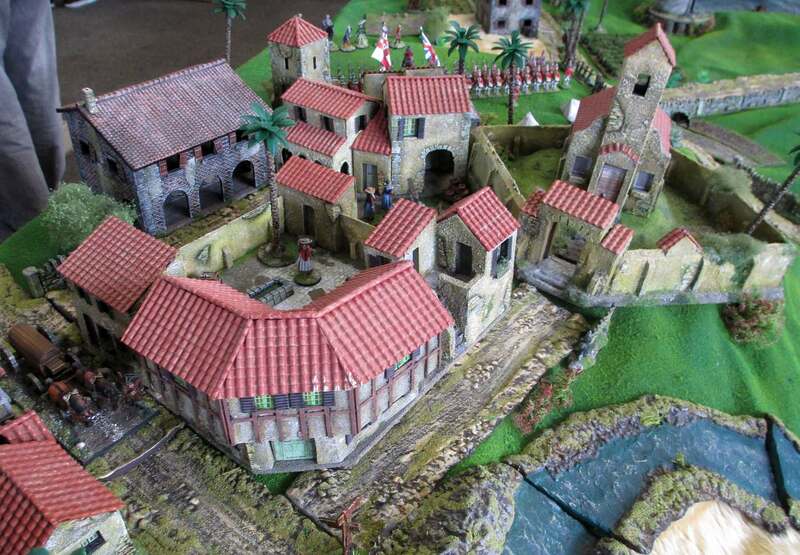 Though, of course, this type of house could have many other uses – the Peninsular War springs to mind, or Maximilian’s Mexican Adventure, the Spanish Civil War, or even colonial games. Here’s the rear of the building, as seen from a ship tied alongside the wharf. 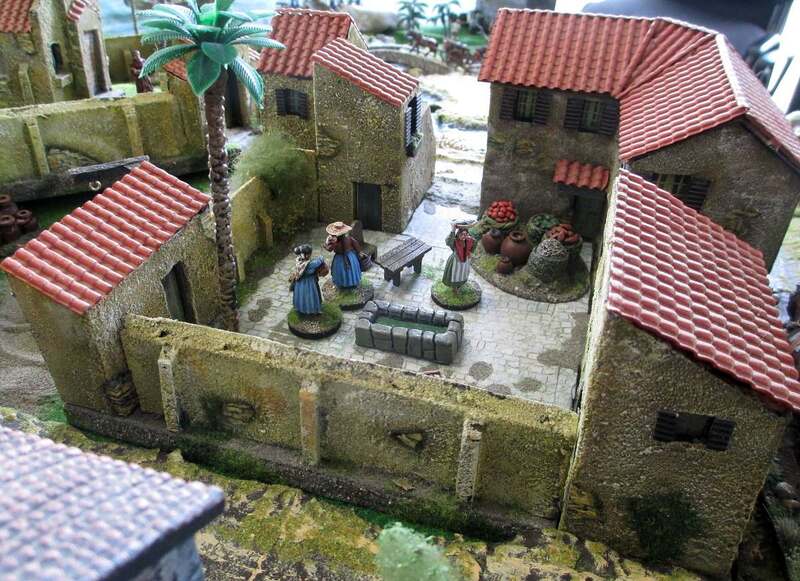 Matt designed the building in a semi-fortified state, with boarded and bricked windows on the ground floor as you would find is times of war and civil unrest. There is limited access on the ground floor, but lots of firing positions on the upper floors. Perfect for a last stand! 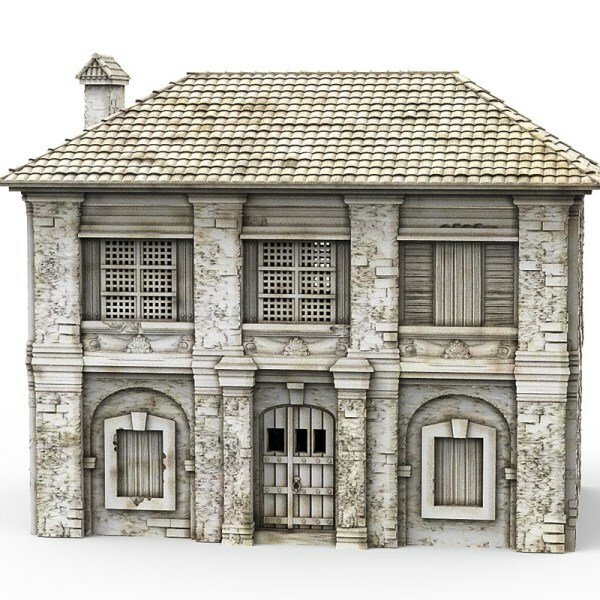 I’m really looking forward to seeing what other buildings Matt adds to Printable Scenery’s Caribbean range. 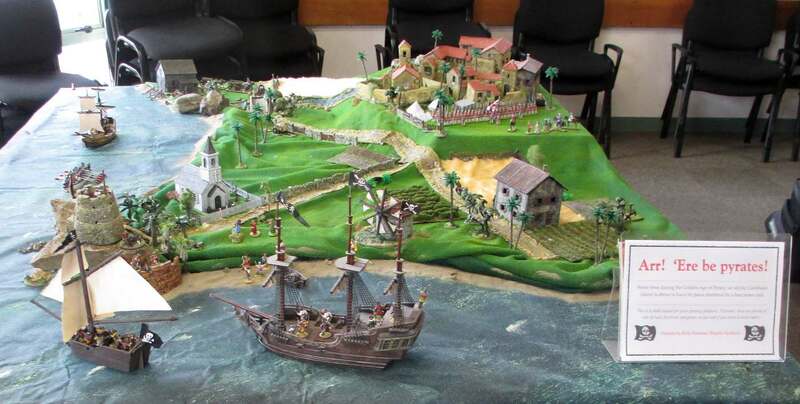 I’ve plied him with photos of real buildings from Havana (Cuba), as well as pictures from the Disneyland ‘Pirates of the Caribbean’ ride – let’s see if any of these come to fruition! 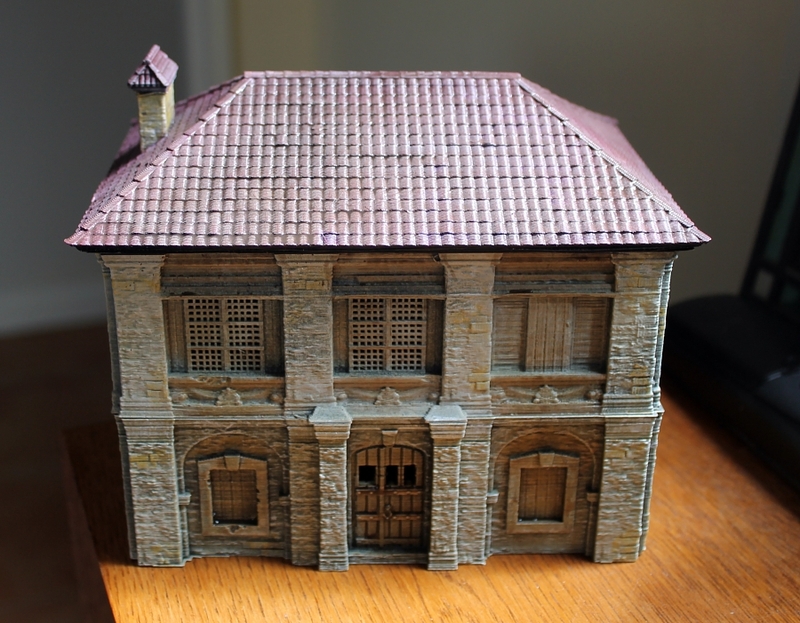 For those who wish to know, the building was printed on a Prusa MK2, using ABS filament. It cost about US$8 to print. Each section took about ten hours, so was printed overnight. It was printed it at .2 layer height at slow speed. 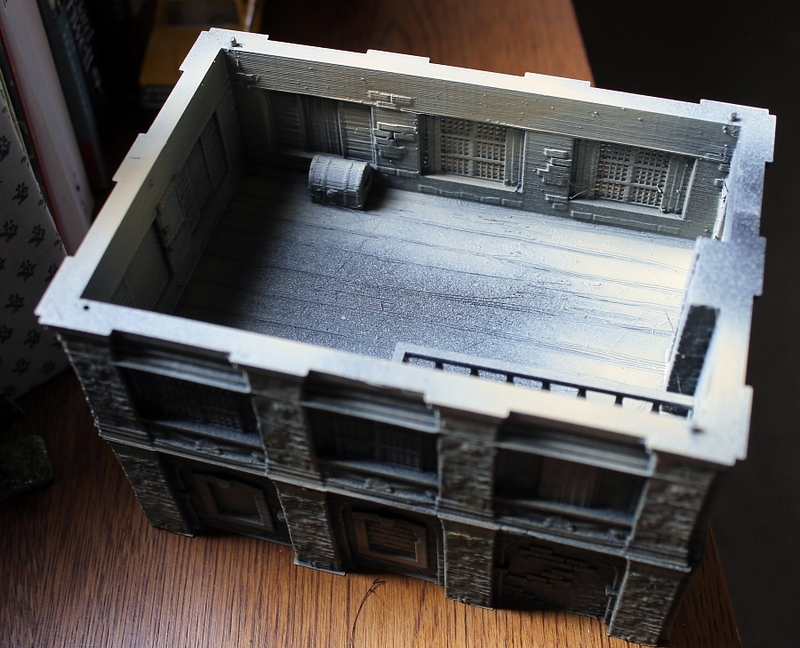 I got it as a raw print, not treated at all, but just primed in Warlord black primer. 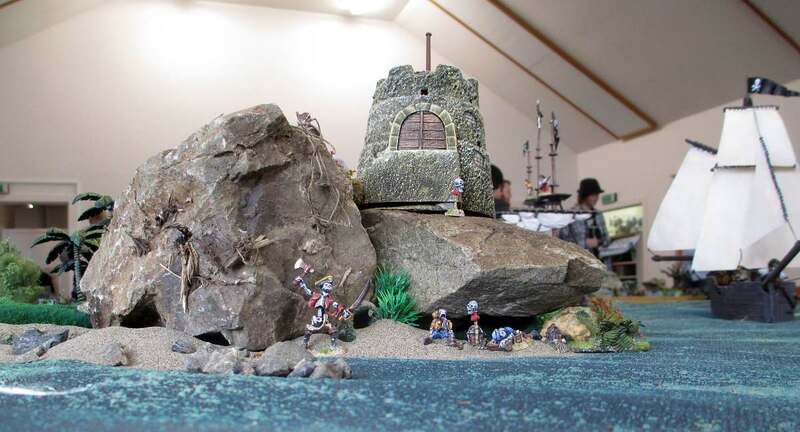 There’s a wargaming superstition that if you reach the bottom of your ‘lead mountain’ of unpainted figures, you’ll die. Well, I’ve been at the bottom of my lead mountain for a few weeks now, and I’m pleased to say that I’m still hale and hearty! 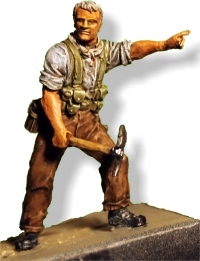 I’ve had several projects on the go over the last few years, but all have now either concluded, or are awaiting the manufacture of new figures. 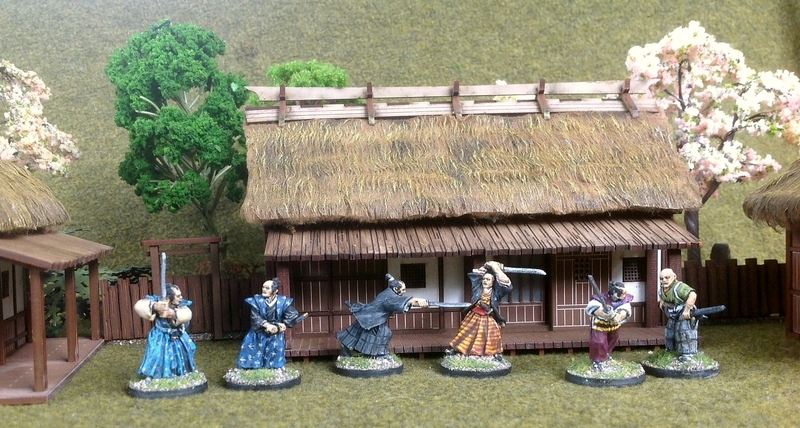 Samurai: I’ve painted two opposing factions (or ‘buntai’) for 28mm skirmish gaming, and made a lot of terrain. But I seem to have used up all my enthusiasm for this period in getting this far. No other possible factions really interest me. 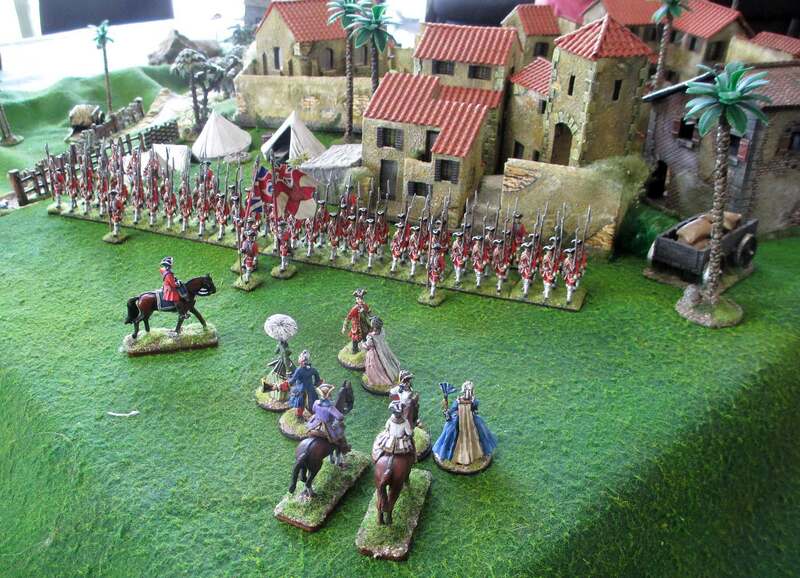 And I have no intention of taking this period beyond skirmish anyway. 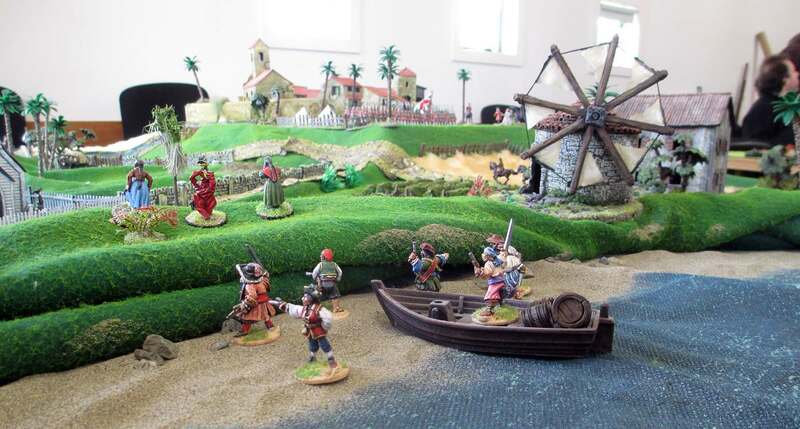 So I’ve got enough figures and terrain for now. 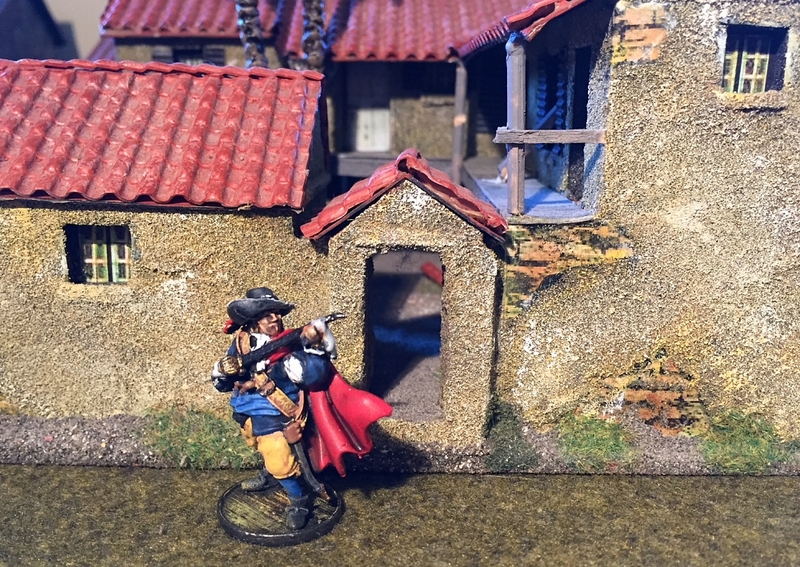 Pirates: This project has been pretty well completed for some time now. We only play with smallish units anyway, so adding more figures to my already more-than-enough collection would be overkill. 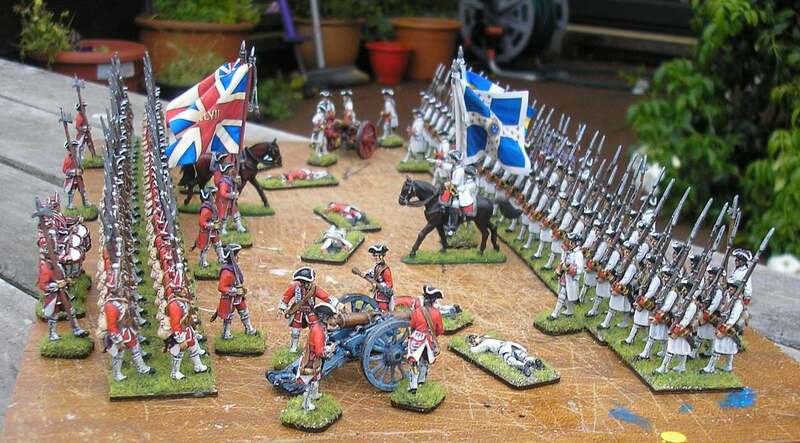 18th century ‘imagi-nation’: I’ve painted all the units that were in the film ‘Barry Lyndon’, so the next step in this project would be to paint some totally fictional units. 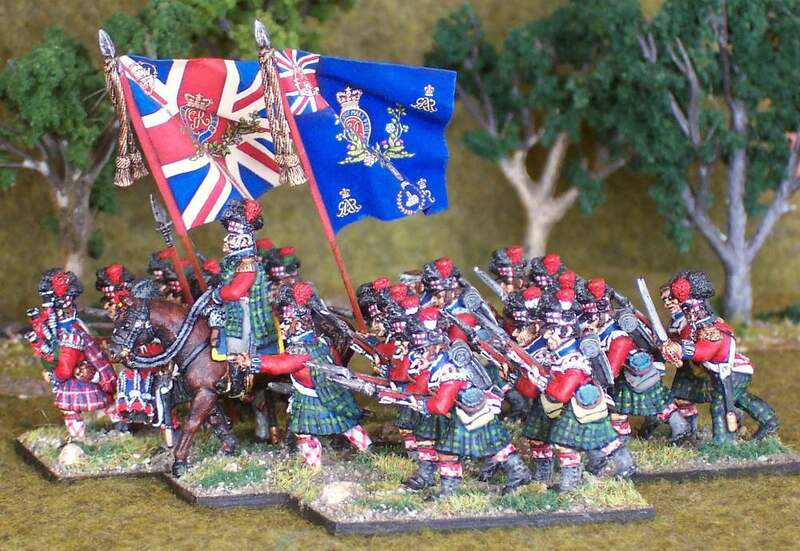 I’ve always fancied the green and red uniforms of the Russians. 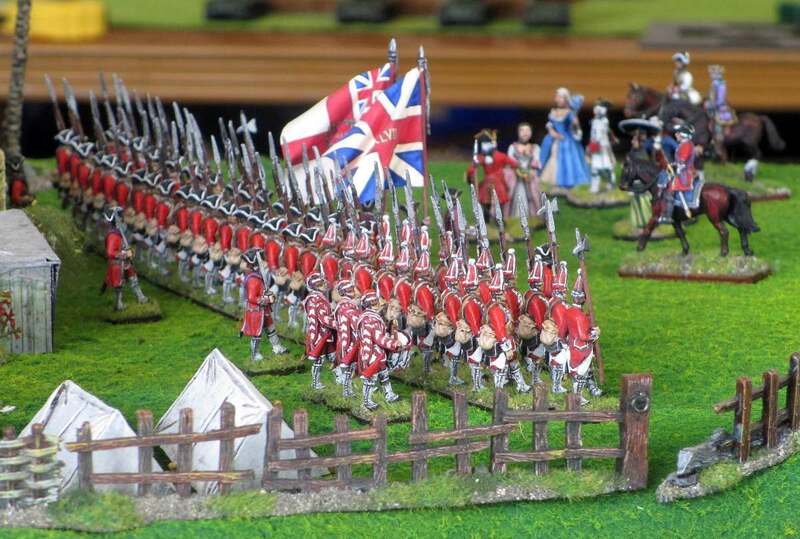 Whilst such a unit would be imaginary, it would seem stupid not to paint actual Russian figures rather than simply re-colour the uniforms of some other nation. 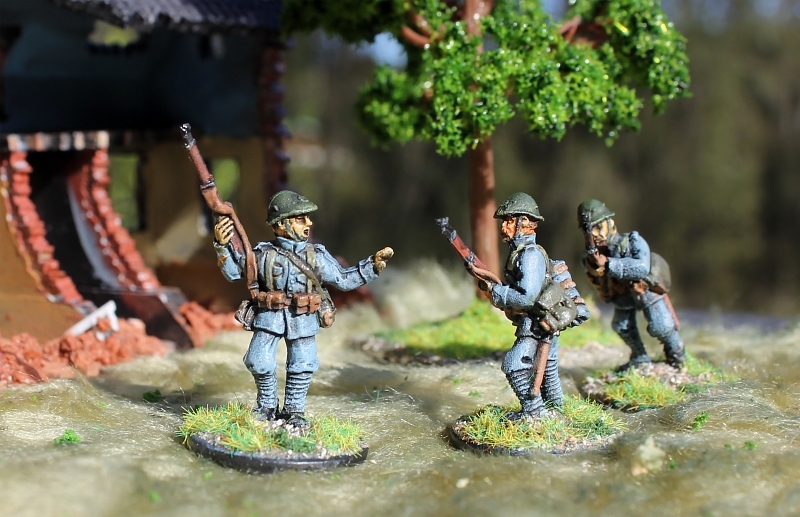 However, my manufacturer-of-choice for this project, Minden Miniatures, doesn’t do Russians yet. So this project is now on hold until they do (in 2015, I’m told). 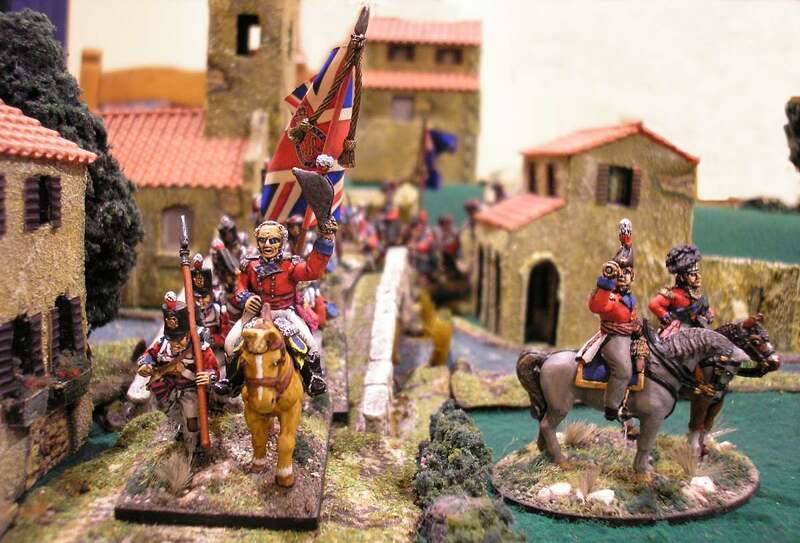 Napoleonics: I’ve got more than enough battalions of British, French, Portuguese and Spanish to play a reasonable Napoleonic game. Adding more will be just repetitive, and I never use all my units at once anyway. 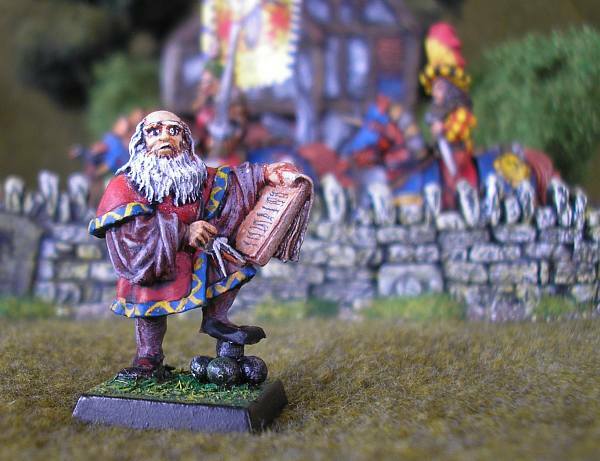 I’ve also got hordes of individually-based ‘big men’ for leading my troops under the ‘Sharp Practice’ rules – but as most of them haven’t even seen action yet, no more are required. 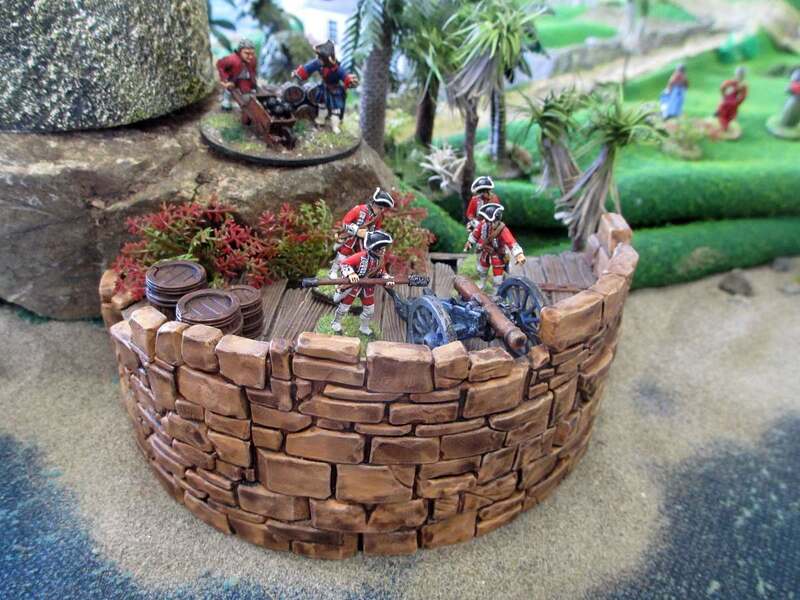 Colonial New Zealand Wars: I’ve now got a couple of sides sufficient for large skirmish games. 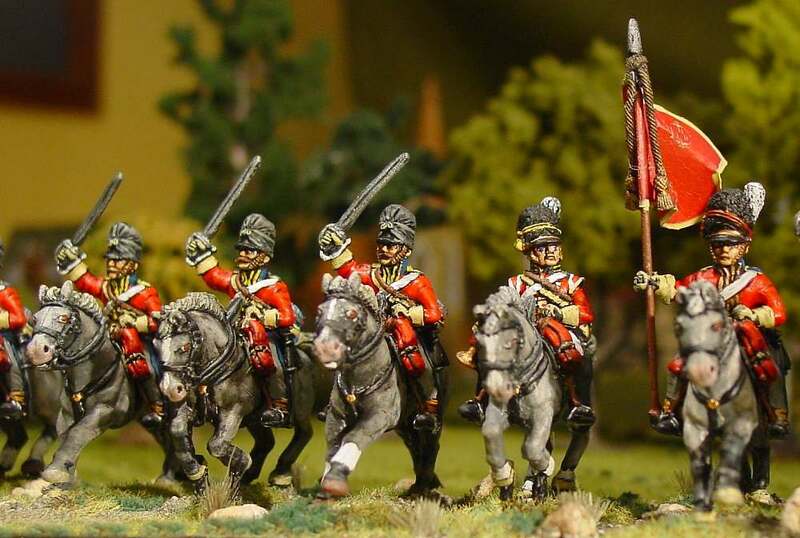 Like my Napoleonics, adding to them at the moment would be just ‘more of the same’, for which I really have no need. 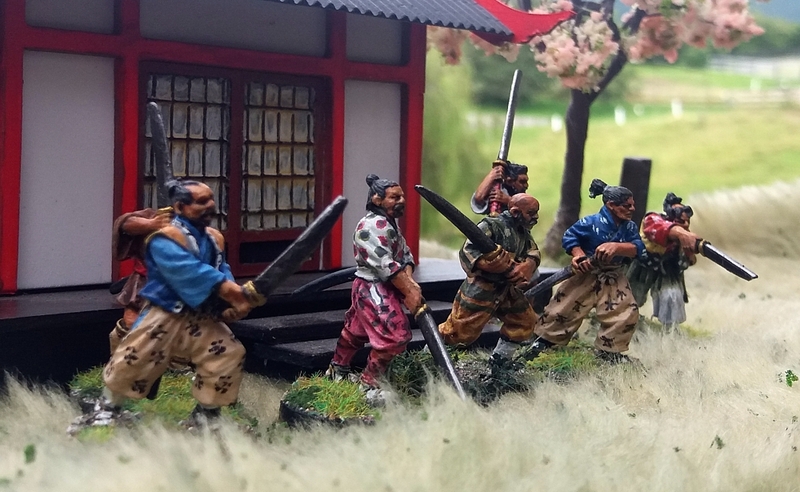 However, this is period dear to my heart, so if Empress Miniatures ever make anything else for this period, I’ll be in like Flynn! 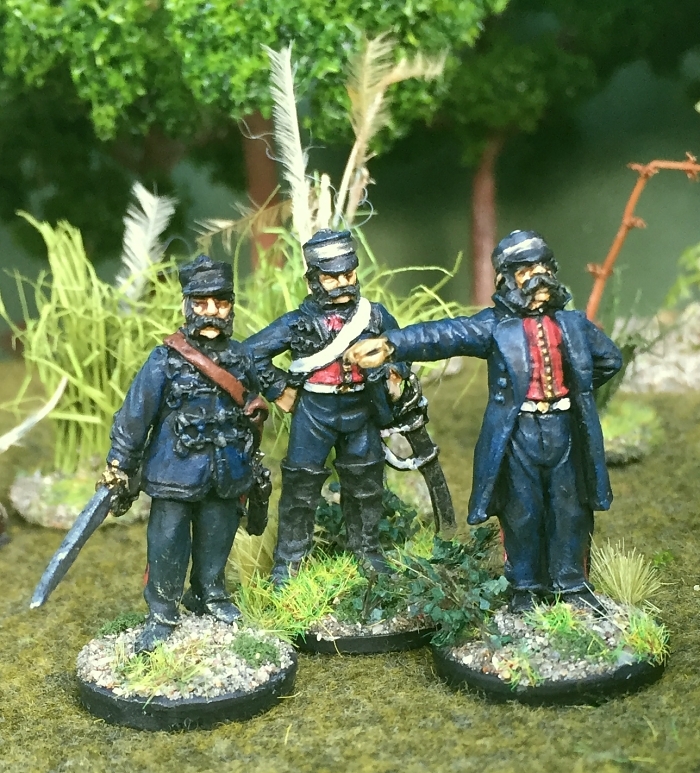 Victorian science fiction: I’ve only painted one unit for this, and it is barely Victorian science fiction, being a French Foreign Legion unit as they appeared during Maximilian’s Mexican Adventure. But I just can’t drum up any more enthusiasm to continue with this project. 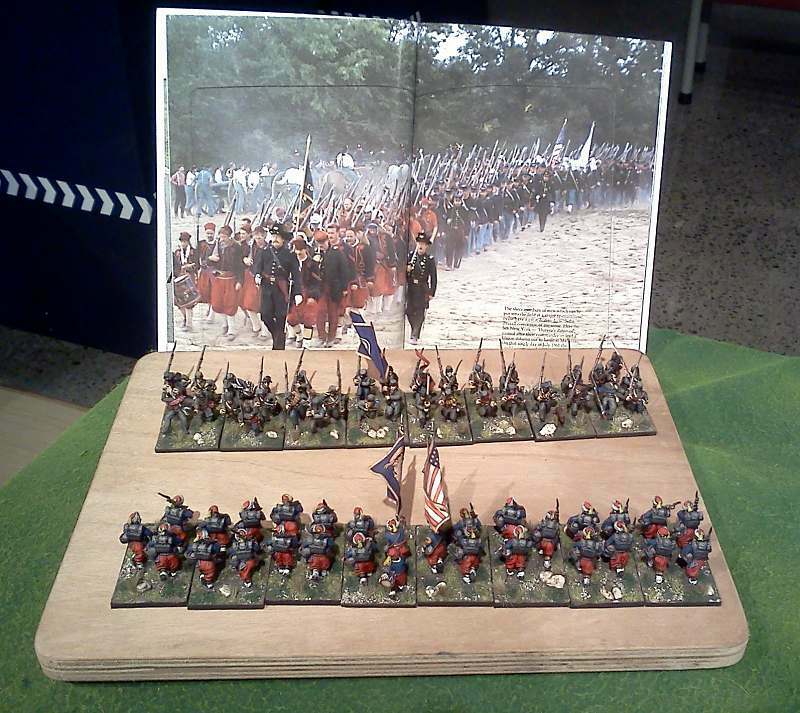 American Civil War: I have a couple of miscellaneous units painted up , but this period doesn’t interest me enough to buy any more. What about starting a completely new period, then? Well, I hate being at the start-point of a project. There is nothing out there that is calling to me sufficiently to overcome the hurdle of starting from scratch. So, where does that leave me? Well, I’m seeing his as a holiday from painting. 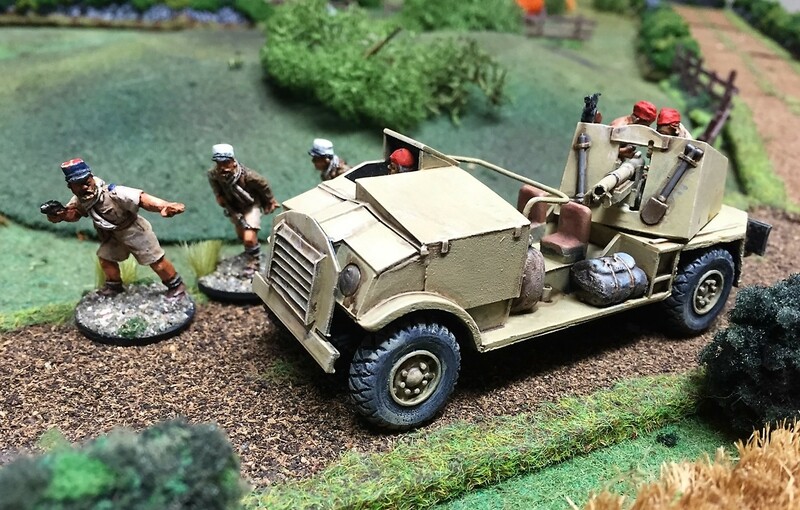 I think I’ll just wait out until either Minden Miniatures (for my Russians), or Empress Miniatures (for new NZ Wars figures) come through. 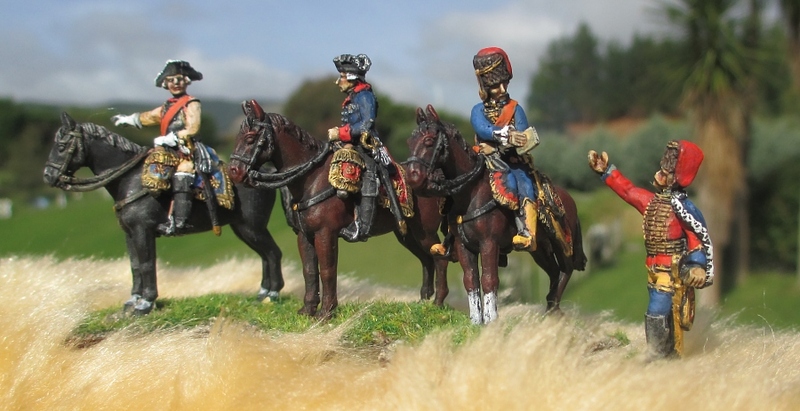 Another possibility is to do some vignettes to decorate the battlefield, especially for my Napoleonics. 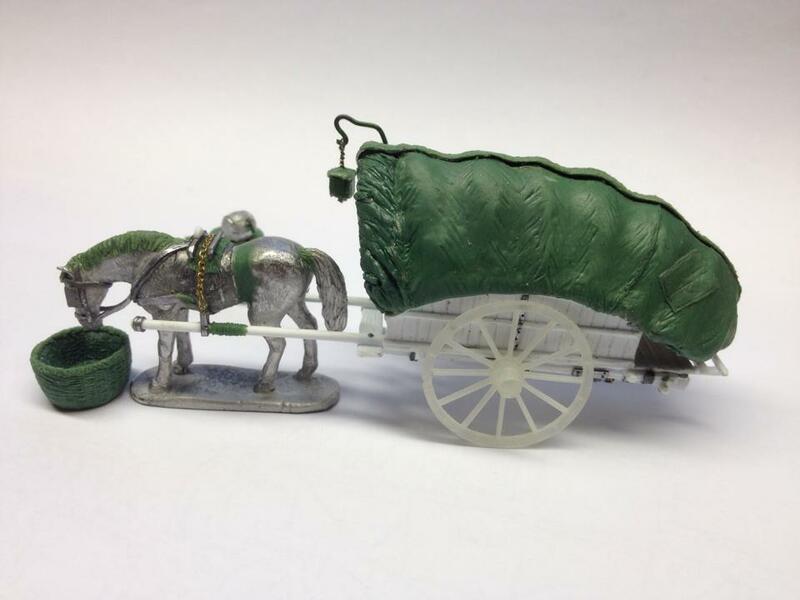 Perry Miniatures and Westfalia are currently making some very nice wagons and other background stuff, such as this lovely little sutler’s cart. 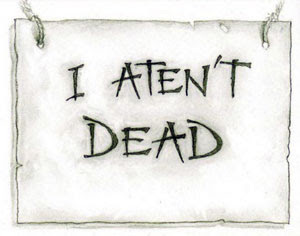 So, I aten’t dead yet!